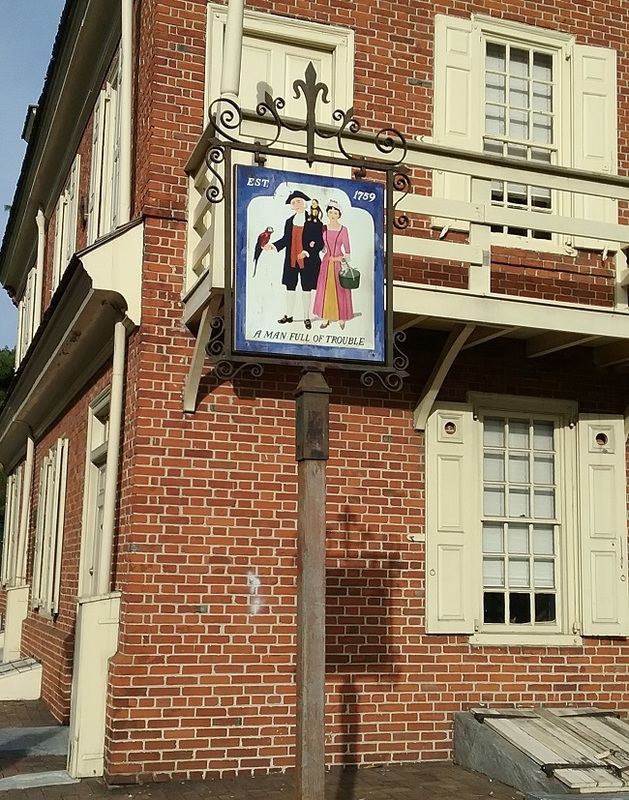 Our recent trip to Pennsylvania included a lot of history, which is the top consideration whenever we plan a trip. I’m lucky that my husband is also interested in the past, as it makes for an agreeable itinerary for both of us. 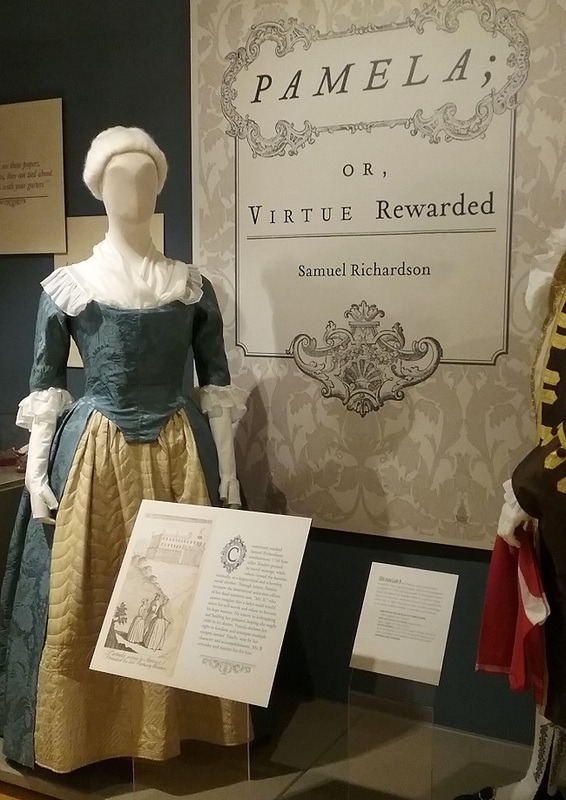 The primary reason for the trip was so I could attend the regional Costume Society of America symposium in Shippensburg, PA, but when we realized how close Philadelphia was, we decided to add a few days to the trip and visit the city. Much of what is now referred to as the Old City is owned publicly and is administered by the National Park Service. 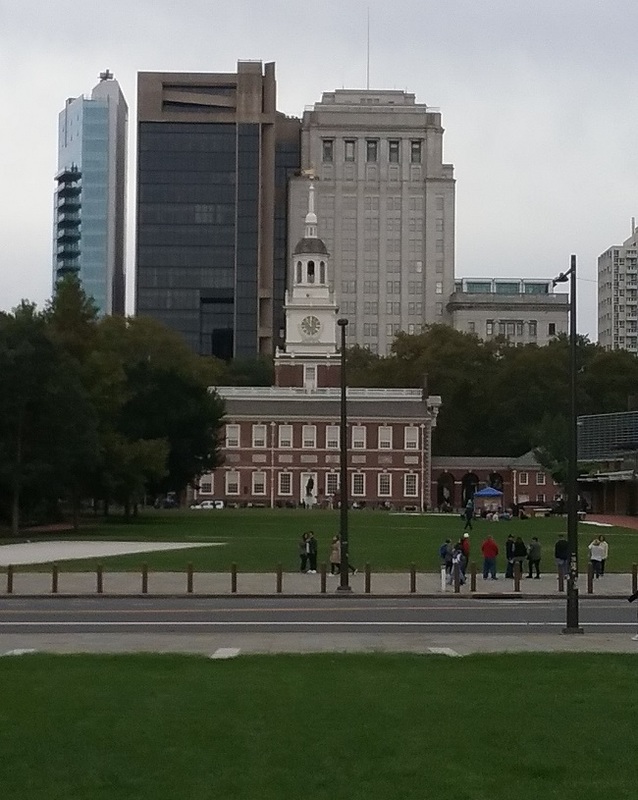 A large part of this is the Independence Hall complex, seen above. 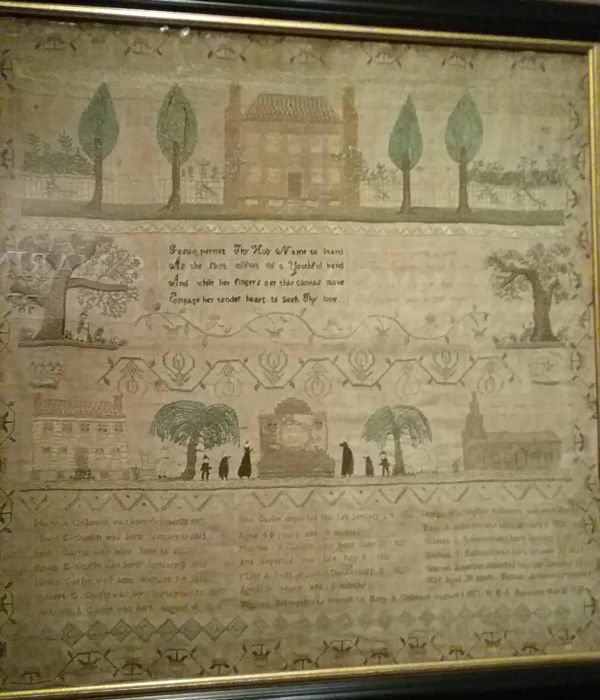 In the center is what was the old Pennsylvania State House, and it was there that the Continental Congress met to discuss and sign the Declaration of Independence in 1776, and where eleven years later the Constitutional Convention was held. To the right is Congress Hall, where the Congress of the United States met after the government moved to Philadelphia in 1790, and behind the trees on the left is where the Supreme Court met. In a building to the right of where I took this photo is where the Liberty Bell is now housed. I always find the juxtaposition of modern buildings and historical ones interesting. Philadelphia is a modern city, and that is left from colonial and early Federal days is scattered throughout the Old City. The house in which Dolly Madison lived with her first husband survives, but the house that was George Washington’s Presidential residence does not. 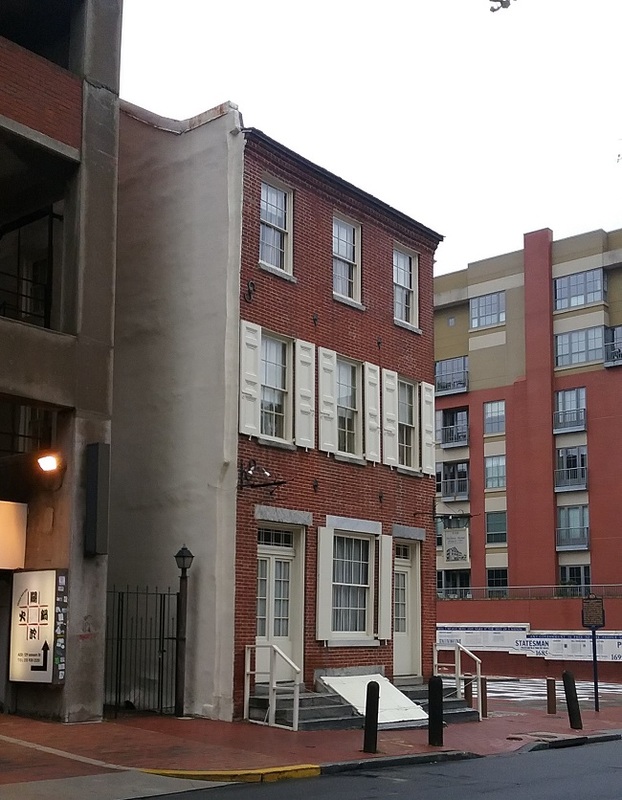 You can visit Betsy Ross’s house, but not Ben Franklin’s. 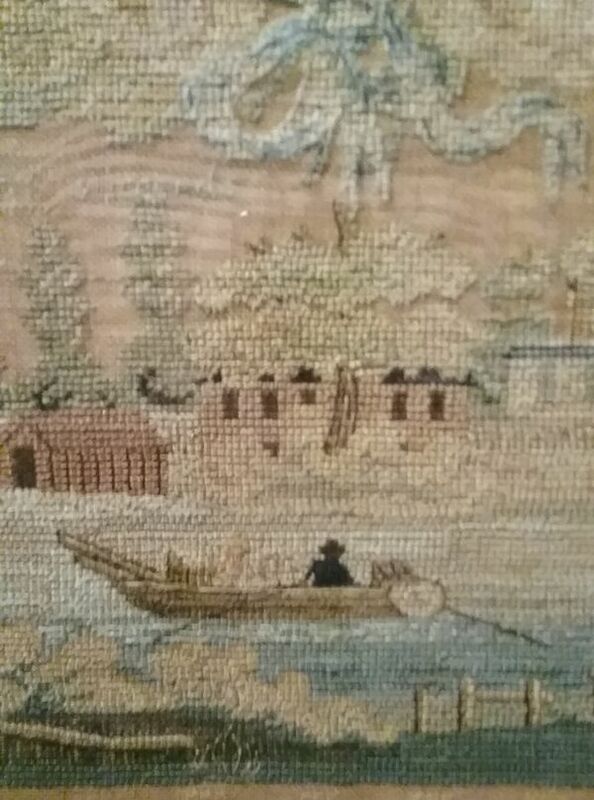 Both Washington’s house and Franklin’s are represented as “ghost houses”, where frames made of white pipes show where the houses would be if they had survived. It’s hard to believe that the President’s residence was torn down, but look at the photo above and you can see the big yard in front of Independence Hall. Years ago this lawn was full of homes and businesses. Washington’s house was located on this lawn. This is the Thomas Bond House, which now houses an inn, and which is where we stayed. To the left is a parking garage, to the right a paved park, and beyond that, an apartment building. The paved park is the site of the home of William Penn, the founder of the Pennsylvania colony. It is useful in such a situation to be able to imagine the missing buildings, and to see this house as part of a street of similar ones. Thankfully, such a street still exists. It’s Elfreth’s Alley, where the houses all date from 1720 to 1830. It is literally in the shadow of Interstate 95 and is just off a busy modern street, but all that is forgotten when walking this alley. So how did it survive? It became home to poor immigrants, and was rediscovered in 1934 when preservation efforts began. If you look at cities where a lot of old buildings survive, you’ll see that poverty is often the reason. And while it’s a shame that so much of historic Philadelphia was lost, the real story might be that it is amazing that so much still exists. For comparison, how many pre-1830 buildings are still standing in New York City. The answer is very few. 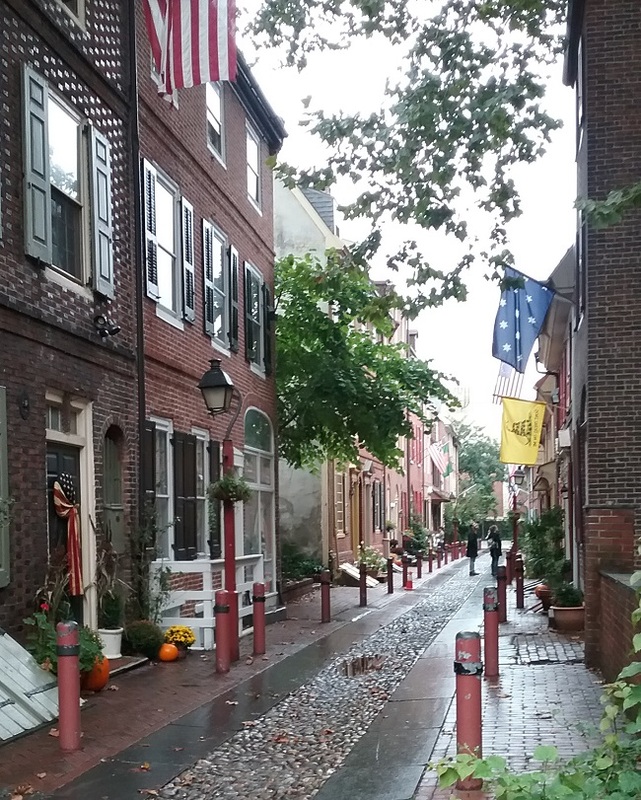 I found this visit to Colonial Philadelphia to be oddly comforting in our stressful political climate. It was a great reminder that the figures of the past were not perfect beings, but they were still able to create a democracy that has lasted 230 years. They enslaved people, even Franklin (who later argued against slavery). They gave women no say in the proceedings, and when Jefferson wrote “All men are created equal…” he meant all white men. In a time when we seem to be going backward in our progress as human beings, this serves as a reminder of how far we have come since 1776. 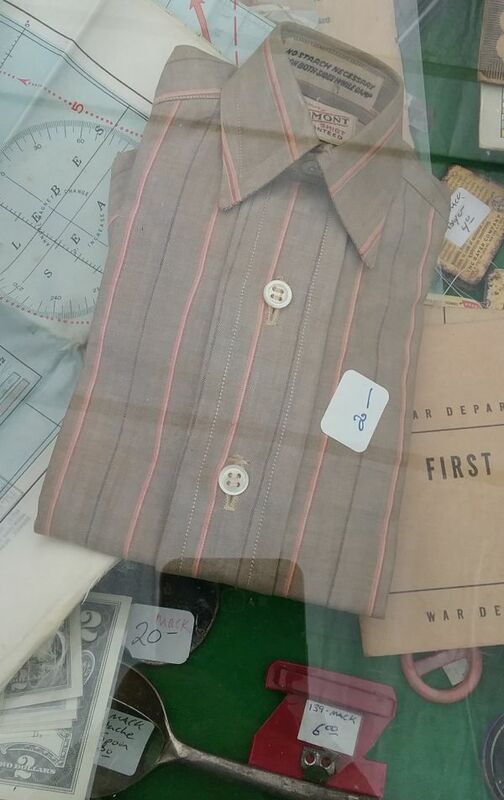 It also helps to remember that history, like fashion, is not linear. I think the best example of this is our recent elections. Total control is no longer in the hands of one political philosophy, but is now shared with those of different views. If you study how our Constitution was written, you’ll see that our country has never agreed on every issue, but it is necessary that all voices be heard. But enough of that – let’s look at signs of fashion history. 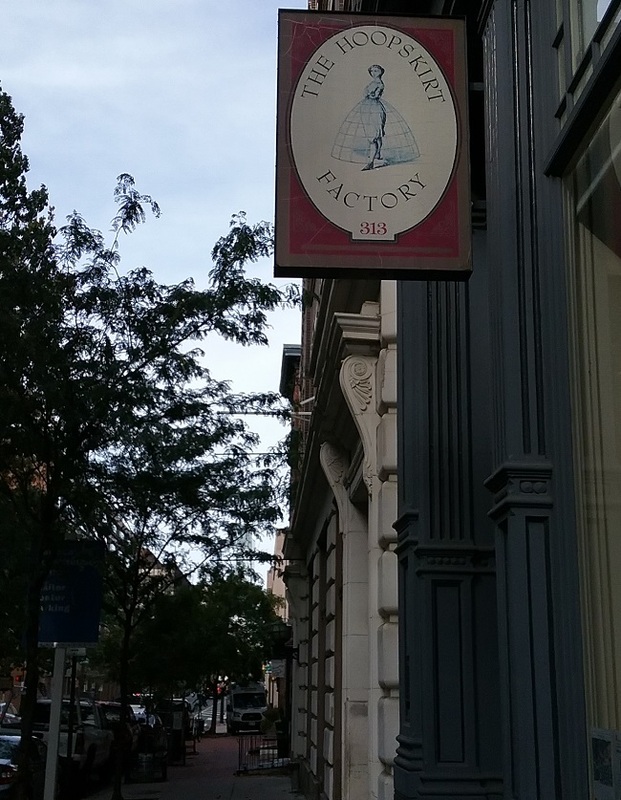 We spotted this sign just down from the Betsy Ross House, but it is not a hoop skirt factory, but an apartment building. At one time this was an industrial building, but I’m unsure if hoops were ever made there. When traveling, don’t forget to look up. This building on Market Street is no longer a seller of trunks and bags, but one can imagine what it must have been like one hundred years ago. 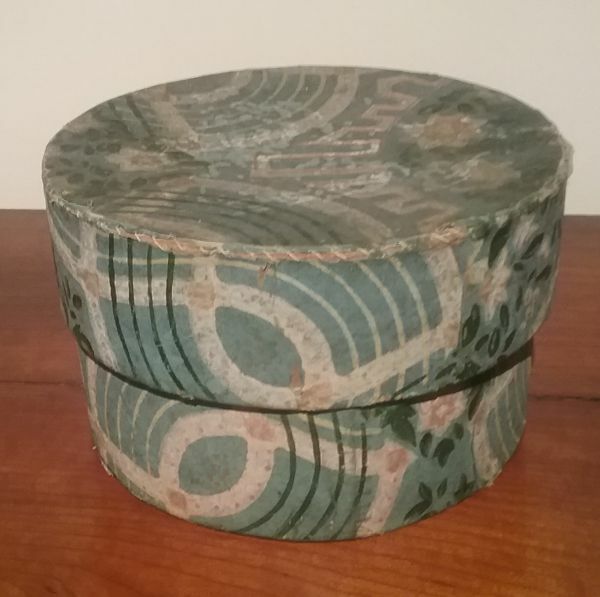 At the site of an old public house, A Man Full of Trouble must have been referring to the hatbox she is carrying. 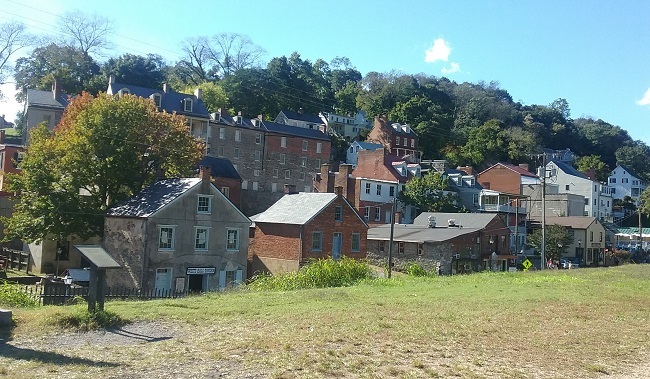 On the way home we stopped in Harpers Ferry, West Virginia, which is most known for the raid of abolitionist John Brown. 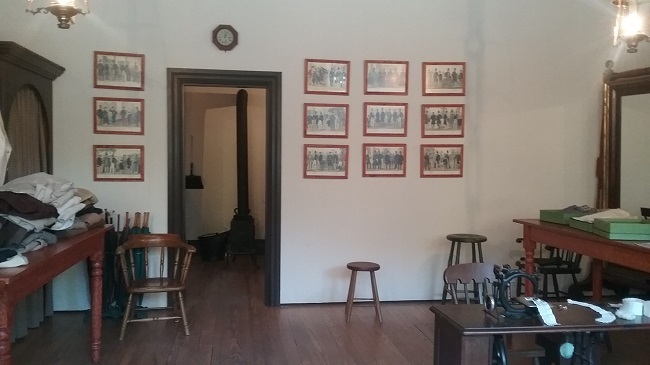 Again, the National Park Service has a big presence, and it interprets not only the raid, but also the town of Harpers Ferry as it was in the nineteenth century. 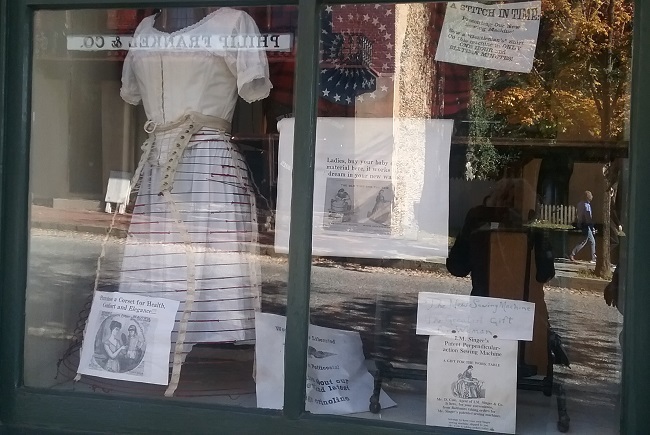 I had been wanting to visit Harpers Ferry since college, when one of my professors declared that everyone in the town had one leg a bit shorter than the other from walking on the hilly streets. I actually can’t confirm that is true. Part of the town is level, and runs along the Shenandoah River. This has been restored to look as the town did in the nineteenth century. 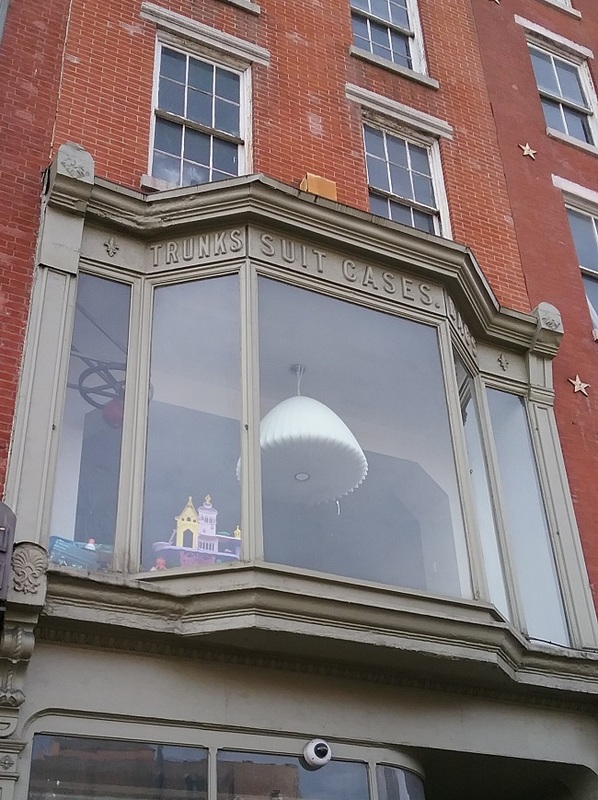 Not knowing this, I got all excited when I saw the shop windows full of antique merchandise. As it turned out, it was just an illusion. 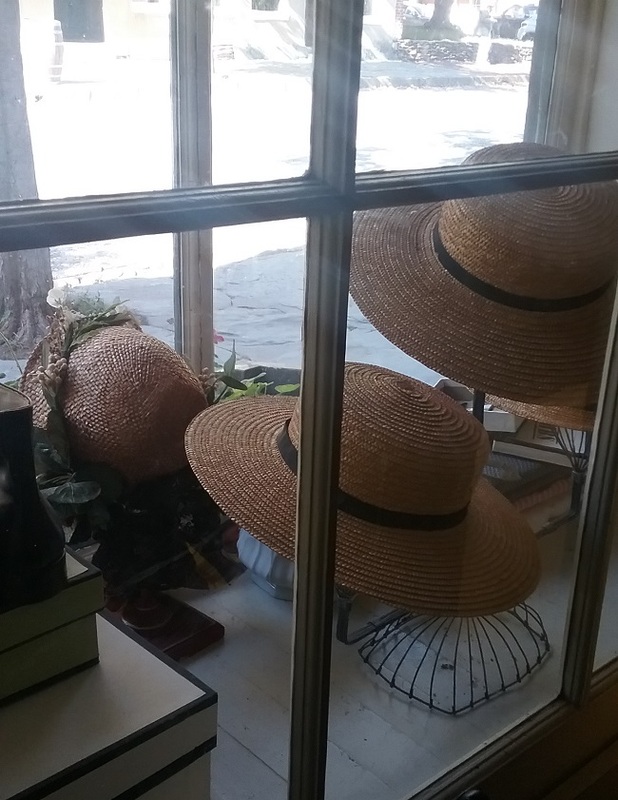 Still, it was fun peering into a general mercantile of the time. 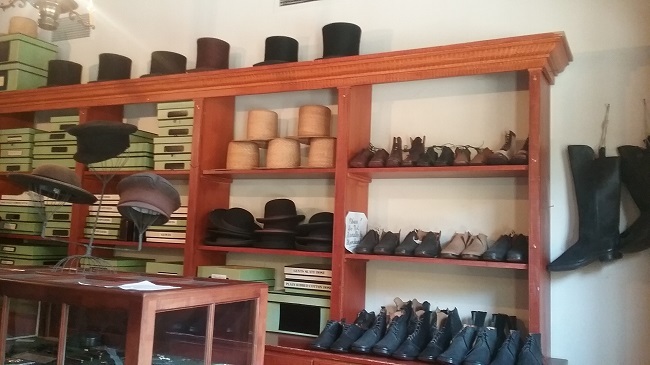 The best interpreted store was an actual men’s haberdashery, Philip Frankel & Co.
Due to it being off-season, there were few rangers about to tell about the buildings, but the park has done a decent job of posting information for those willing to take the time to read. 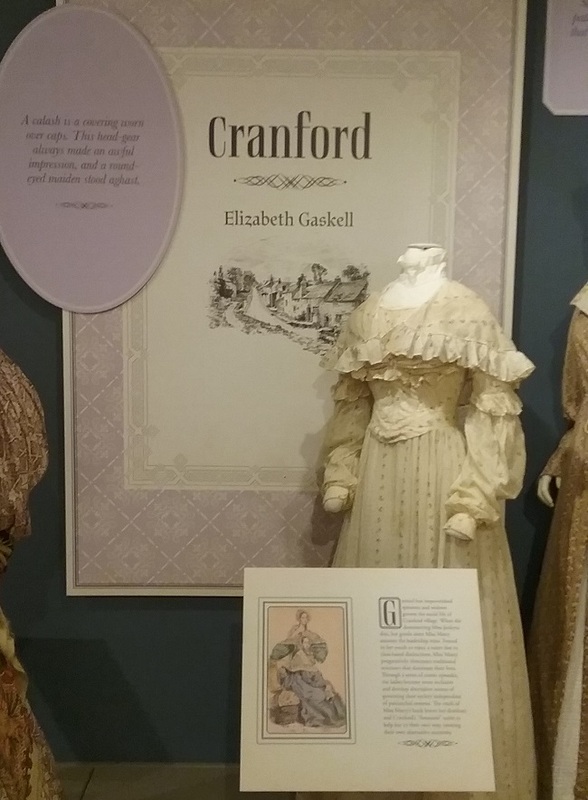 Today I finish up my review of The Fashion of Fiction, starting with one of my favorites, Cranford, by Elizabeth Gaskell. 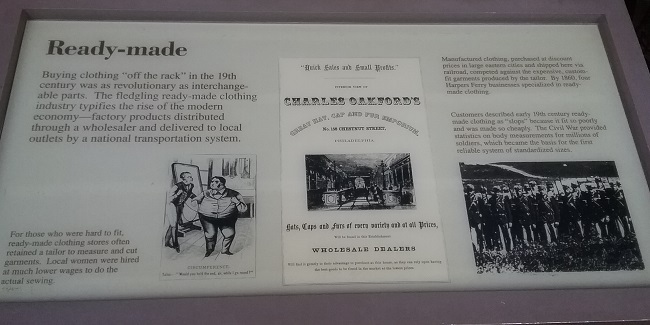 If you aren’t familiar with Cranford, a word of warning – there is no real plot. 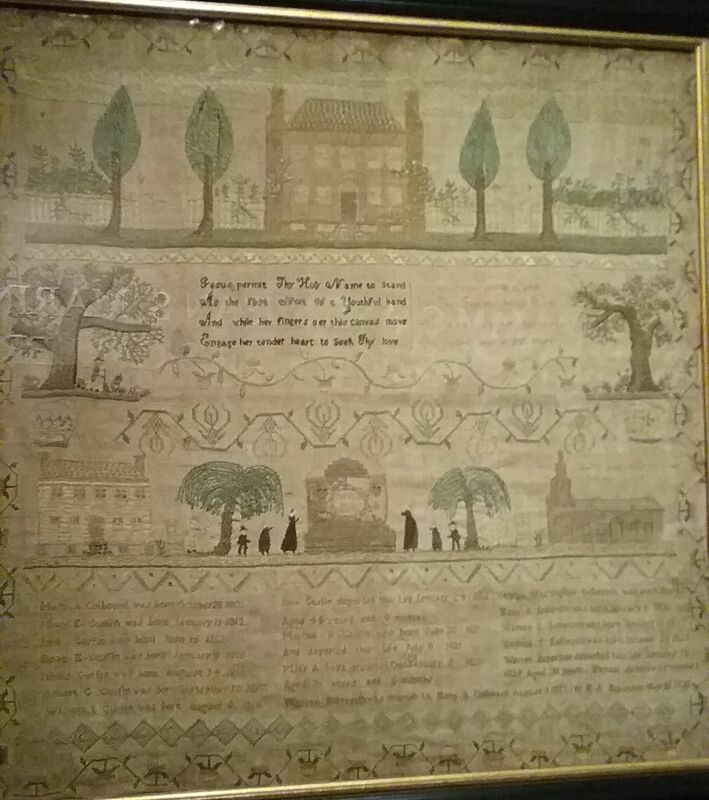 The chapters are like stories all based around the primarily female inhabitants of the village of Cranford. It’s a terribly old-fashioned place, struggling to come to grips with the modern age. 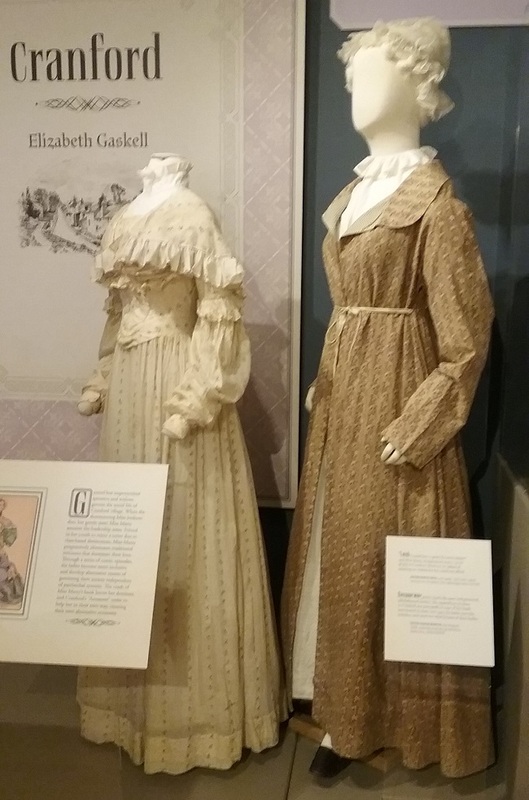 On the left is a circa 1837-1841 cotton print gown with matching capelet. 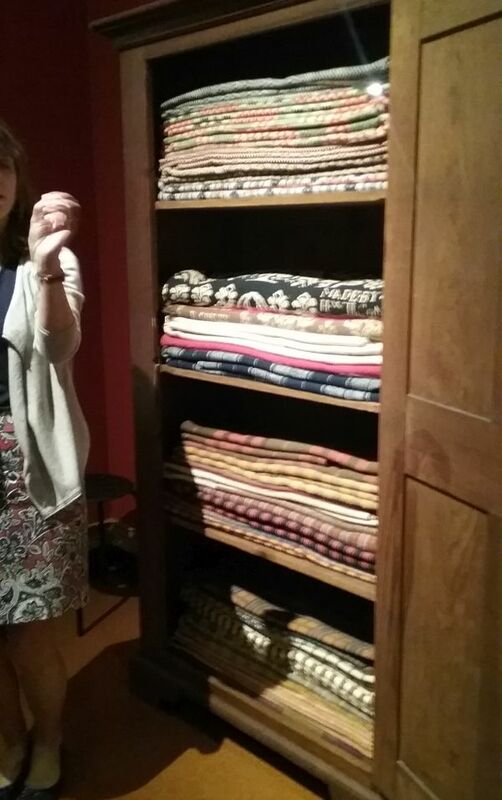 On the right is a circa 1820s wrapper, or a robe we would call it today. 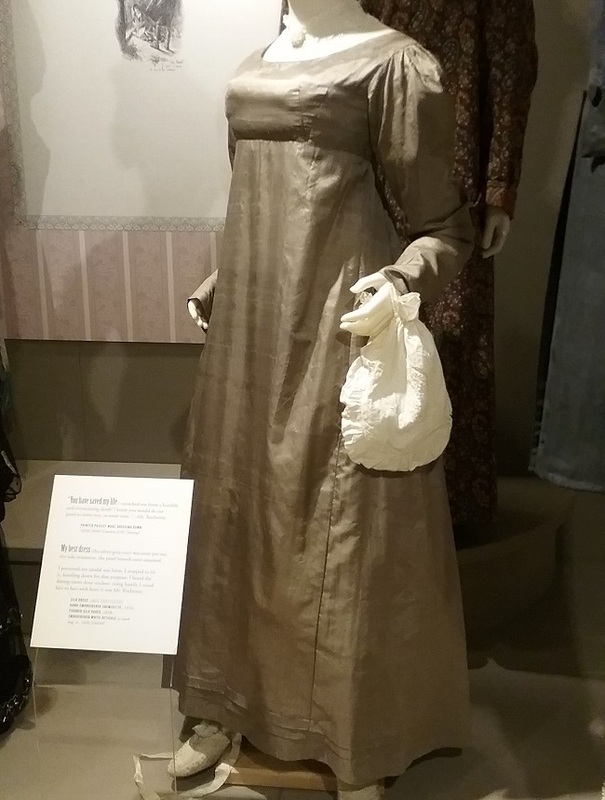 The cap (circa 1830s) was an important accessory for the ladies of Cranford. A new gown might be too costly to consider, but a new cap was attainable for even the poorest resident. 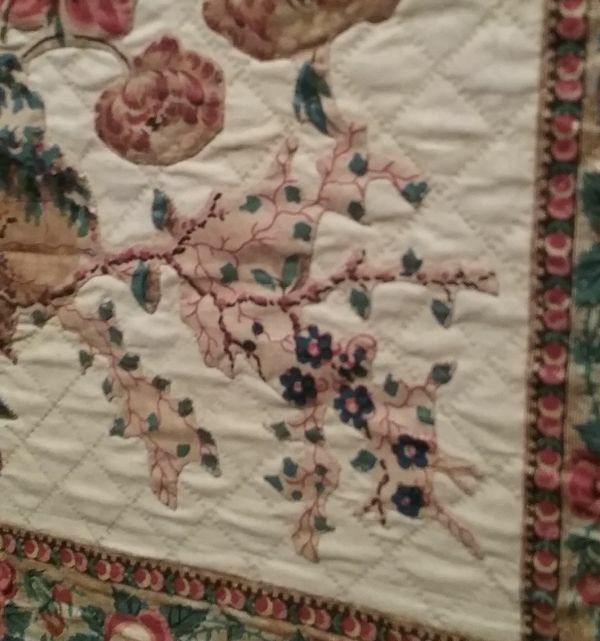 Accessories were often made at home, especially if the object could be knit or crocheted. 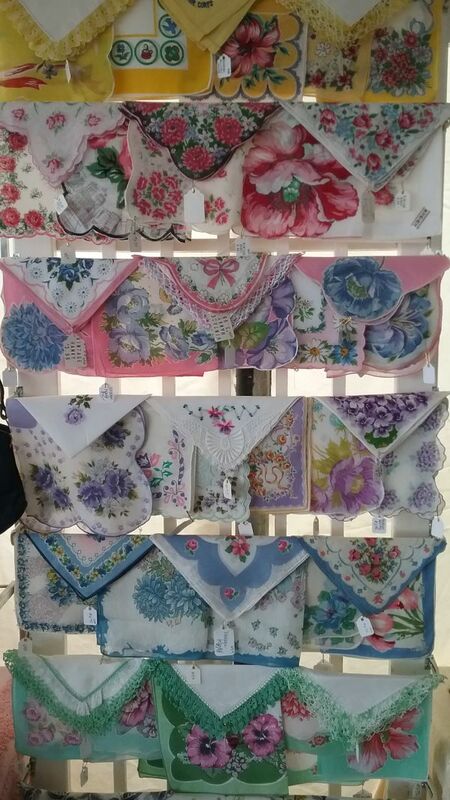 This selection of nineteenth century accessories could have been made by any accomplished needleworker. 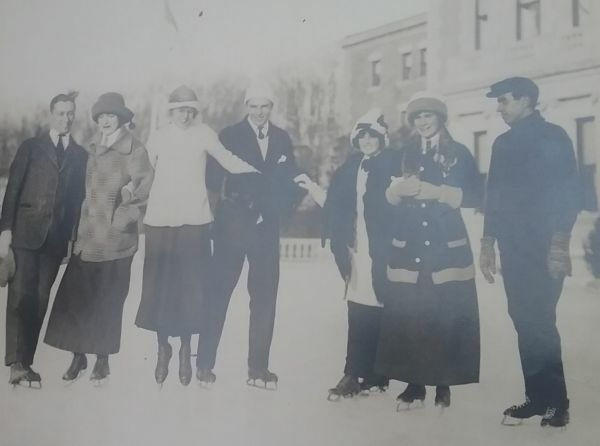 It was said that the last gigot sleeve (fashionable in the early 1930s) was seen in Cranford. 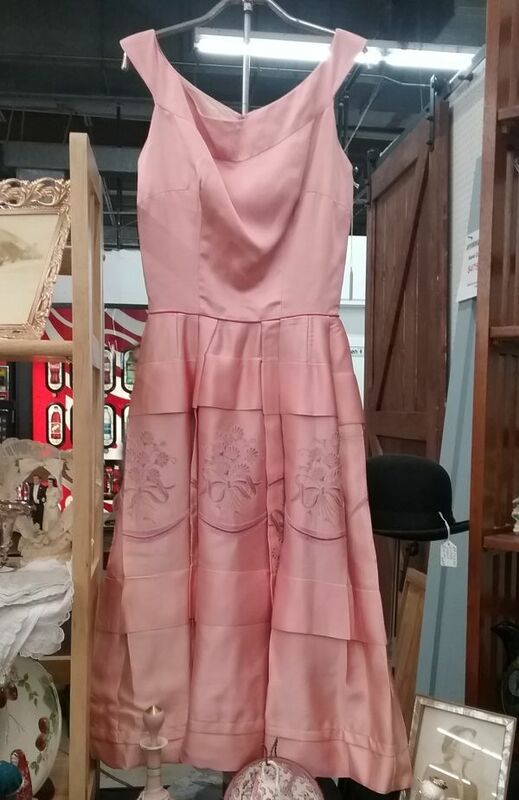 It were this dress, I can see why the wearer was reluctant to give it up. 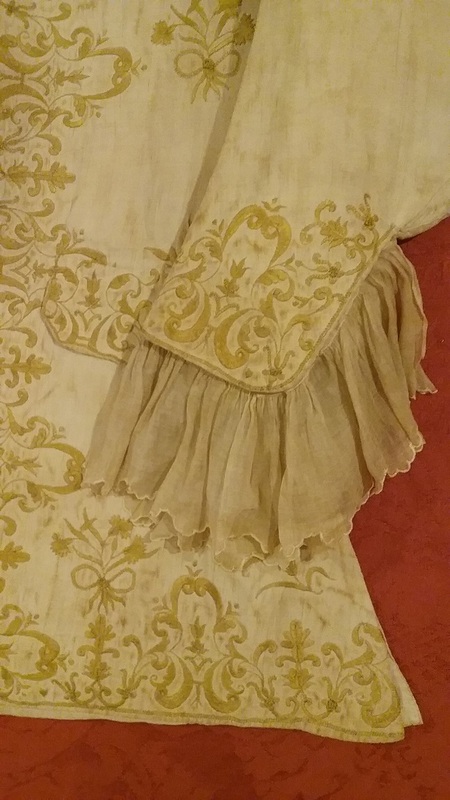 Under the big sleeves are sleeve plumpers, which were usually attached to a woman’s corset, and which were necessary to maintain the puffiness of the gigot. 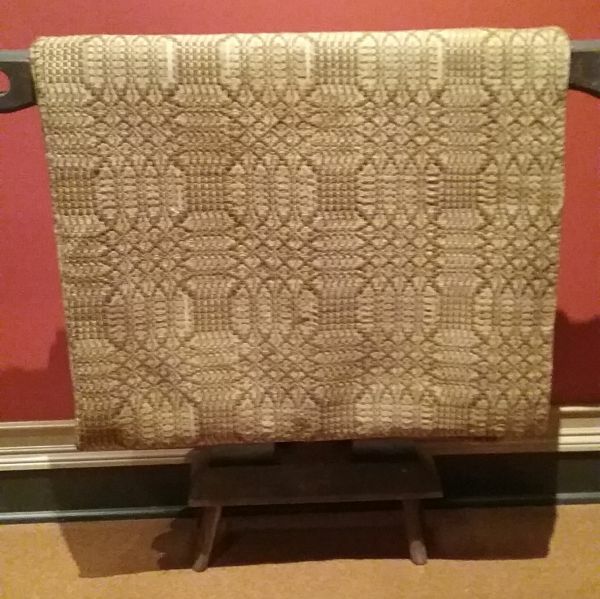 The bonnet is an early nineteenth century calash, which folded like the cover of a calash carriage. Over her silk slippers, our model is wearing pattens, which elevated the wearer’s feet out of the dirt and mud of the streets. I read Madame Bovary my freshman year in college, and I’ll admit I was much too young (or, perhaps, immature) to understand Emma Bovary. I haven’t been able to convince myself to revisit it, though someday maybe I will. 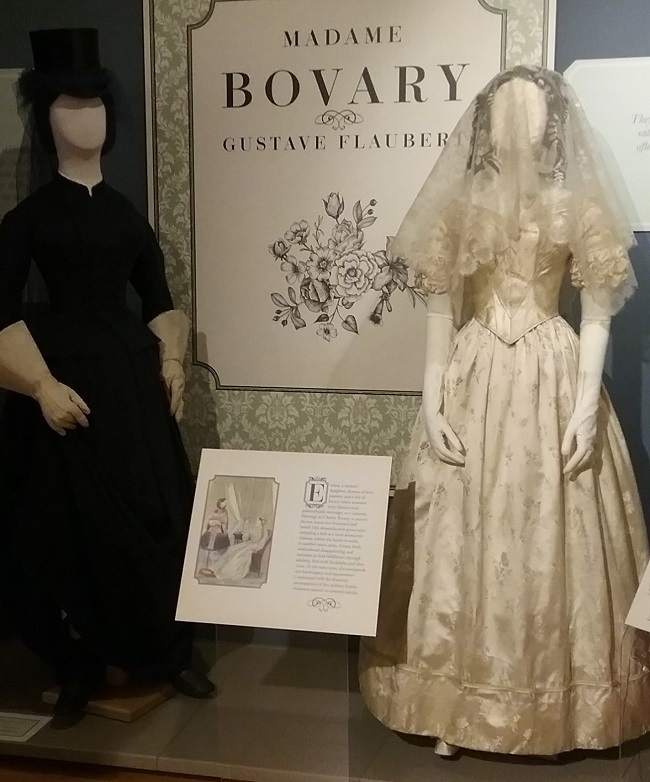 On the right is a wedding gown of the type Emma would have worn on her wedding day in the early 1840s. 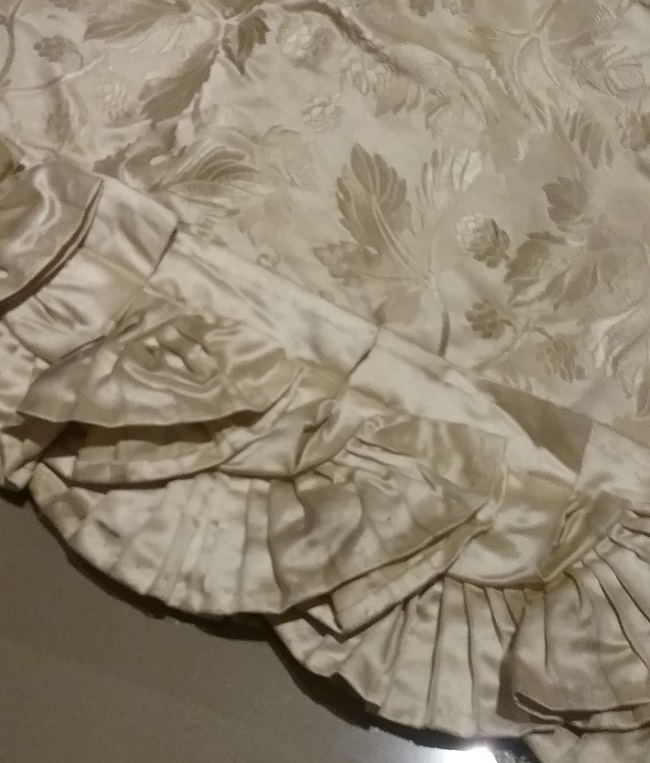 The dress actually belonged to Mary Winchester Cunningham, who married in 1843. The veil was worn by bride Sophia Raburg Hall, a few years earlier. I was happy to see two riding habits on display. 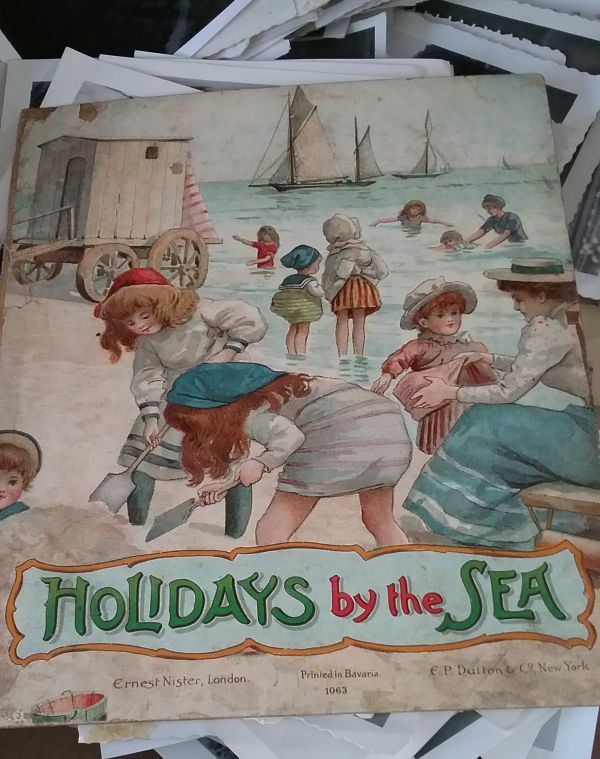 This one dates a bit later than the dating of the book, the 1860s. I love how they has all the accouterments – the boots, the hat, and especially, the gauntlets. 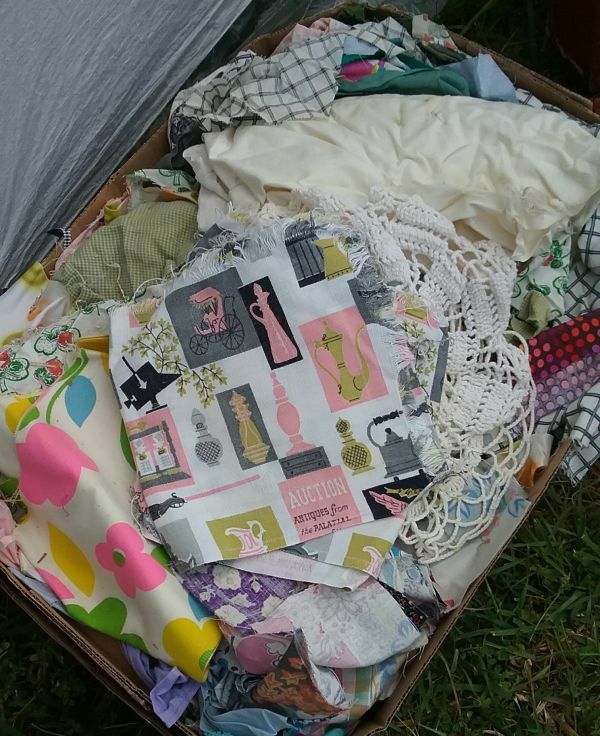 Not to give the plot away or anything, but Emma Bovary spent a good deal of her time in her luxurious wrappers, entertaining her lover. 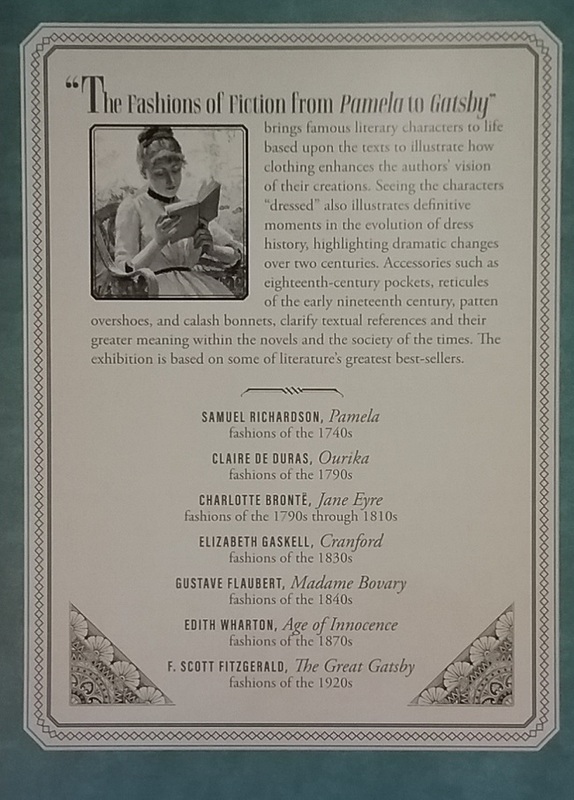 Probably the best represented of the novels presented was Edith Wharton’s Age of Innocence. The book was written in 1920, but takes place in New York in the 1870s. 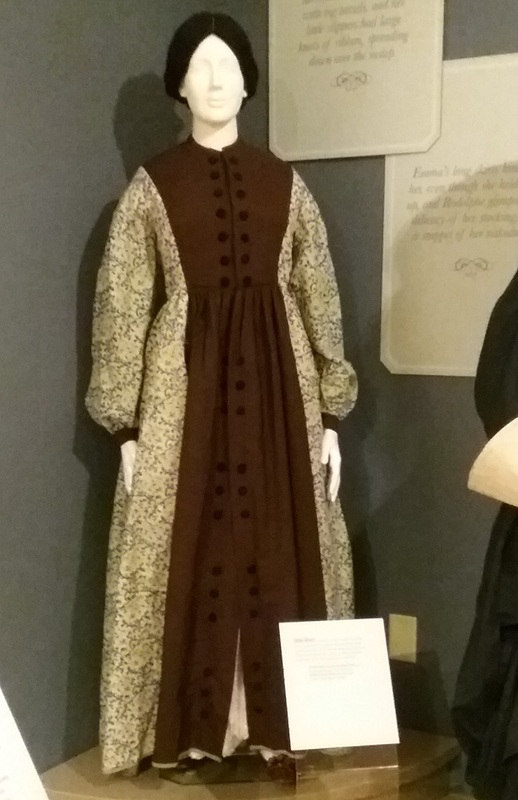 The brown dress above represents one of the minor characters, Janey Archer, the spinster sister of the male protagonist, Newland Archer. Age of Innocence has three young women characters, all of whom represent the limitations placed on them by the rules of society. Janey’s unmarried and unhappy state is reflected in her somber color choices, and her increasingly ill-fitting dresses. 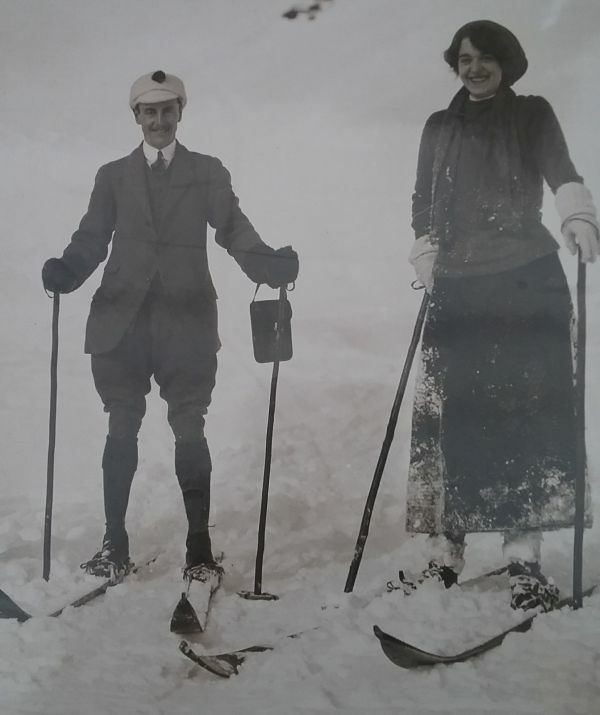 Newland Archer was betrothed to the perfect society bride, May Welland. May often wore white, a symbol of her cool nature. 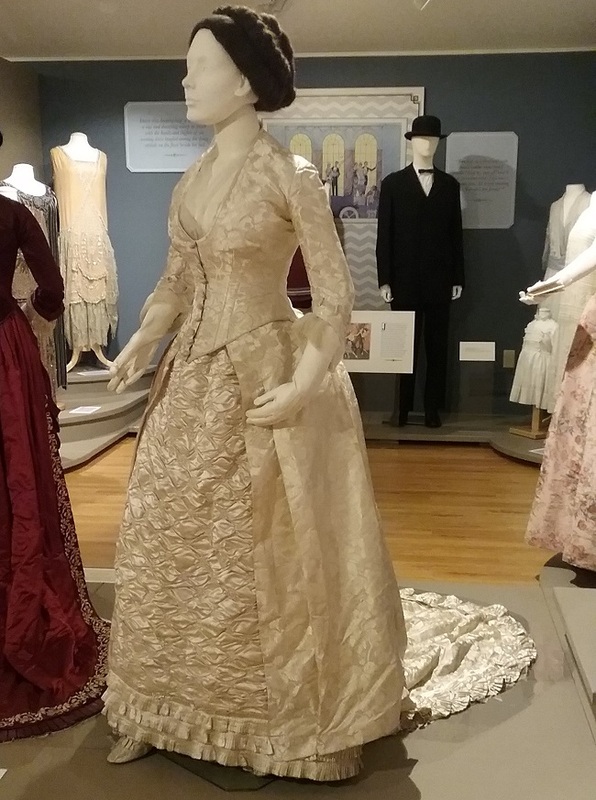 This stunning gown was the circa 1880 wedding dress of Amy D’Arcy Wilson. Her marriage was a failure, but the dress, a smashing success. The third young woman in the novel, is “the other woman”, May’s cousin Ellen. Even before they marry, Newland falls for the red-wearing and exciting Ellen, who is, inconveniently, already married. 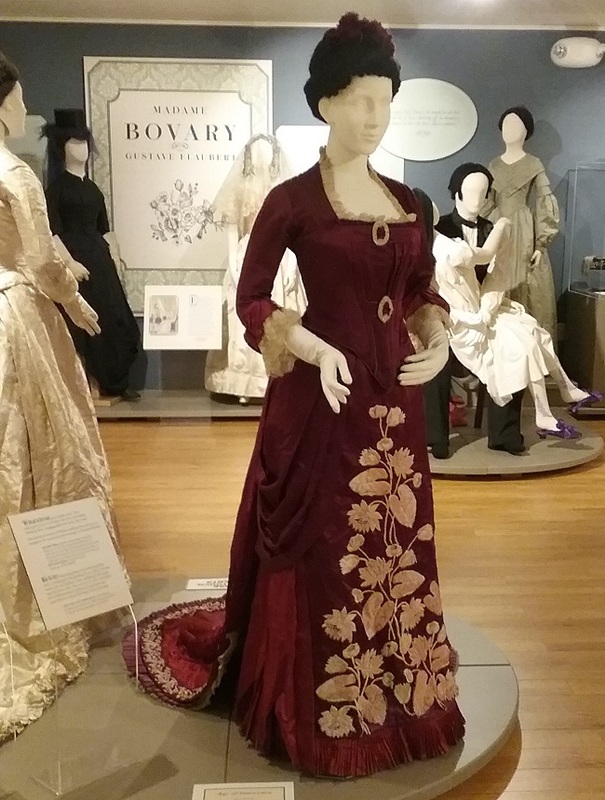 This stunning embroidered dress dates to around 1880, and was worn by Maria Duvall Stockett. 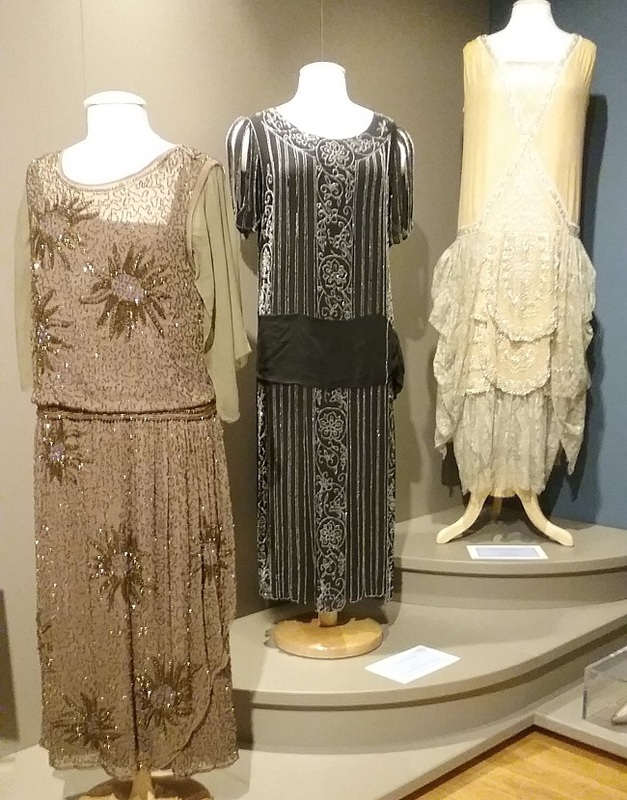 And finally, here are fashions that represent The Great Gatsby, written by F. Scott Fitzgerald, and taking place in the summer of 1922. 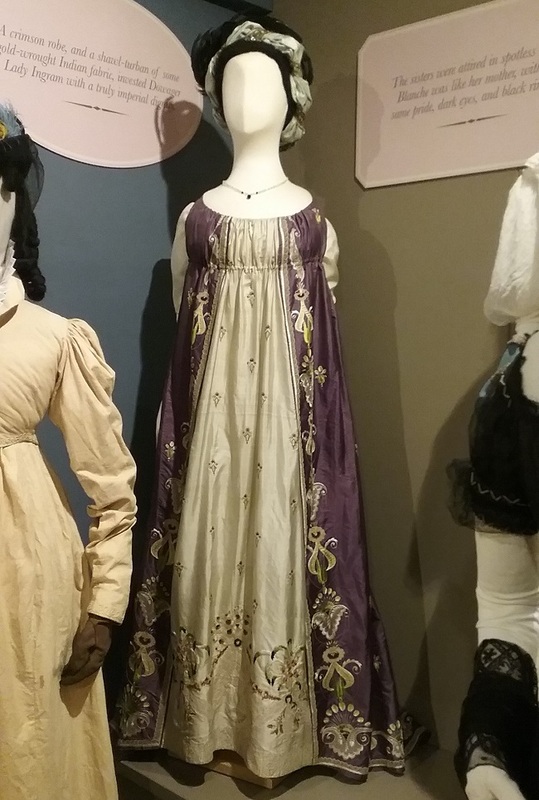 Hollywood has usually set the story a bit later, and so we’ve come to expect knee-length “flapper” dresses, but what the Fashion Archives and Museum gave us is much closer to the true setting. 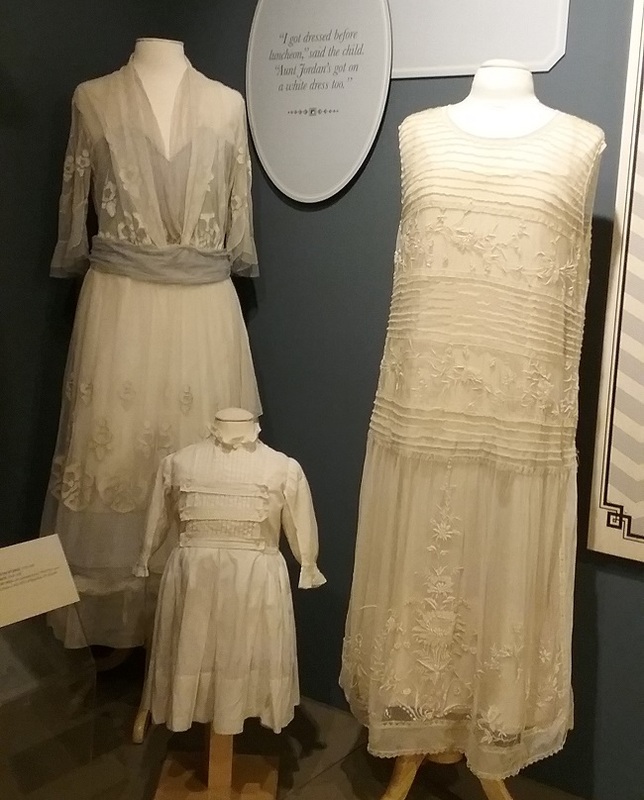 The summer dresses worn by Daisy, Jordan, and toddler Pammy would have been similar to what is shown here, though the one with blue might be a tad old-fashioned. If you know the story, you know the significance of the man’s bathing suit. If you don’t know this, then do yourself a favor and read the book. 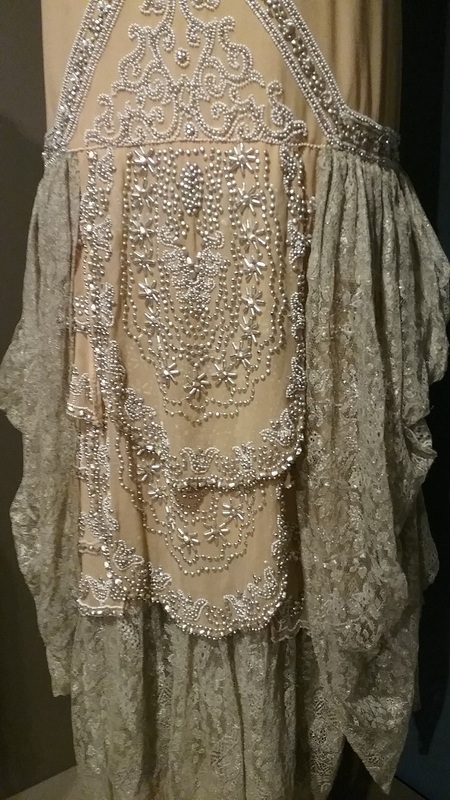 There was a nice assortment of evening gowns, again in the style of the early 1920s. I only wish they had Jordan Baker’s golfing ensemble! I can’t say enough about how well put together this exhibition is. The staff and students involved are to be congratulated on an outstanding job. See it before it closes in April, 2019. 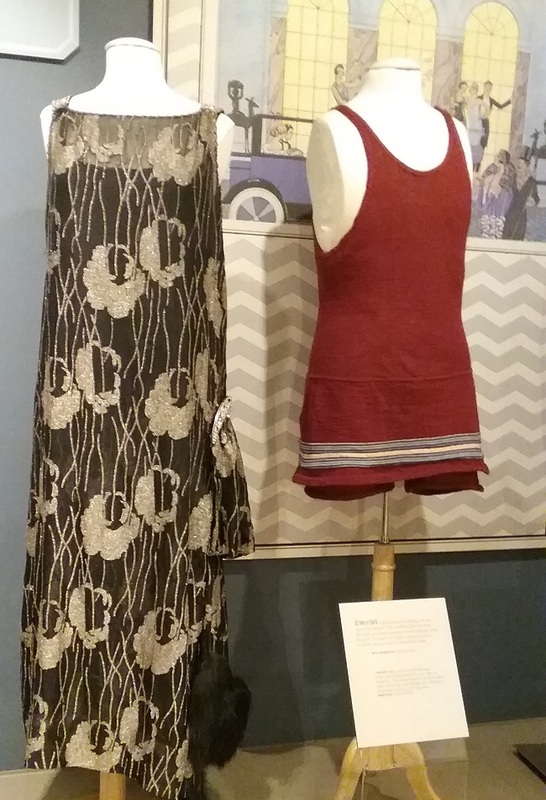 One of the highlights of my recent trip was The Fashions of Fiction from Pamela to Gatsby at the Fashion Archives and Museum at Shippensburg University. I’d never been to Shippensburg, but I know of their collection due to an exhibition I attended at the DAR Museum in Washington, DC, a few years. 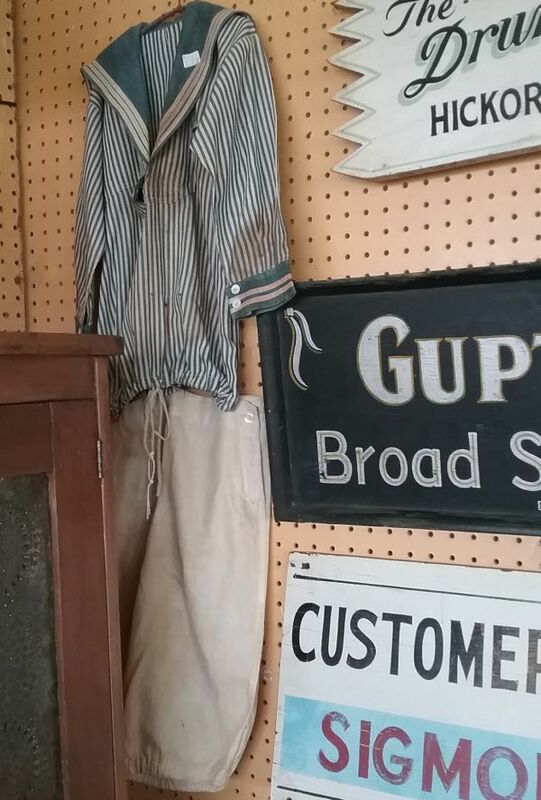 In that show, some of my favorite garments had been loaned from Shippensburg, and I’ve been wanting to visit ever since. I got my chance when the Costume Society of America Southeast and Mid-Atlantic regions planned a symposium at Shippensburg. I’ll be posting more about the symposium, but today is all about FA&M. 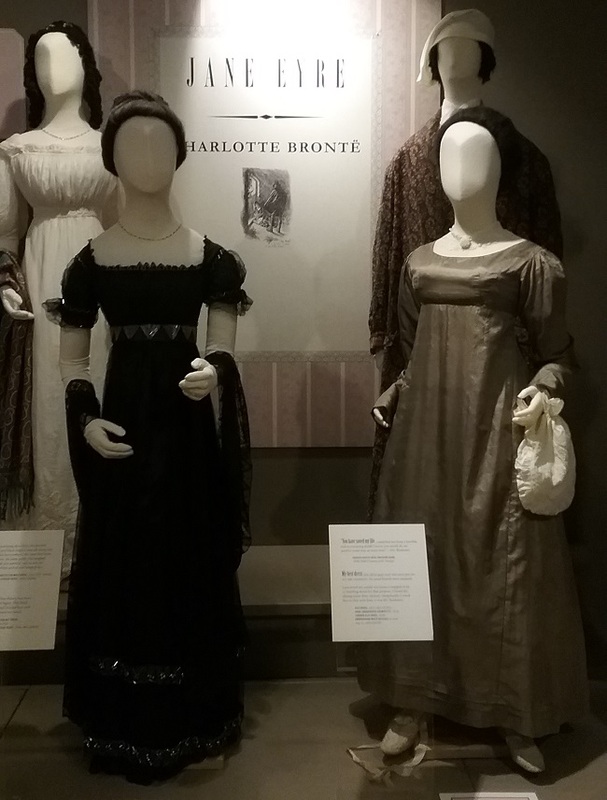 As you can see above, the curator, Karin Bohleke, chose seven works of fiction, and then illustrated the characters through the use of the types of clothing they would have worn. 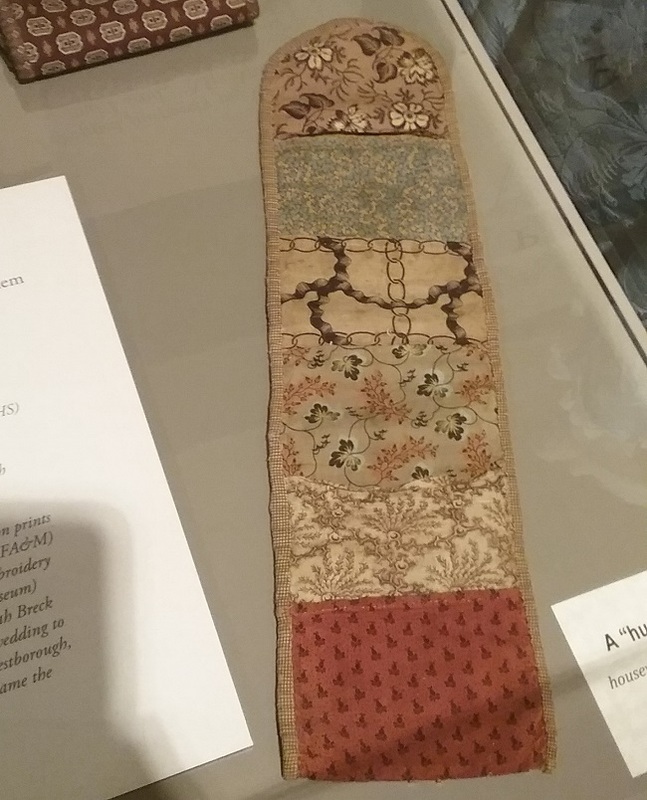 This is not a new concept, as it especially pertains to Jane Austin, but the choice and range of the novels was interesting in that it also presented a sort of fashion timeline, with a few gaps. It was also interesting because not all the characters were rich, and not all were white. I liked that there was a mix of female and male authors. There was not only women’s clothing, but also that of men and children. It really helped that I had read five of the seven works, and I’ll go ahead and suggest that any of you who might be visiting Shippensburg before this exhibition closes in April, should have read all seven novels. 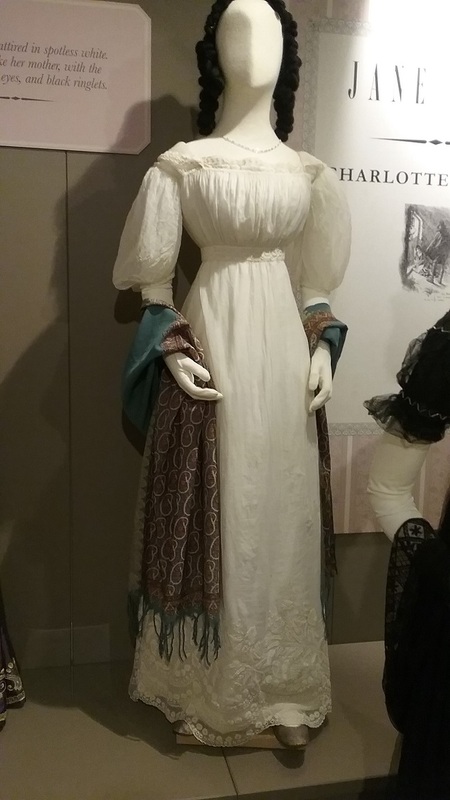 I had not read Pamela, but there was a short synopsis of each novel, and notes concerning how garments were important to the story. 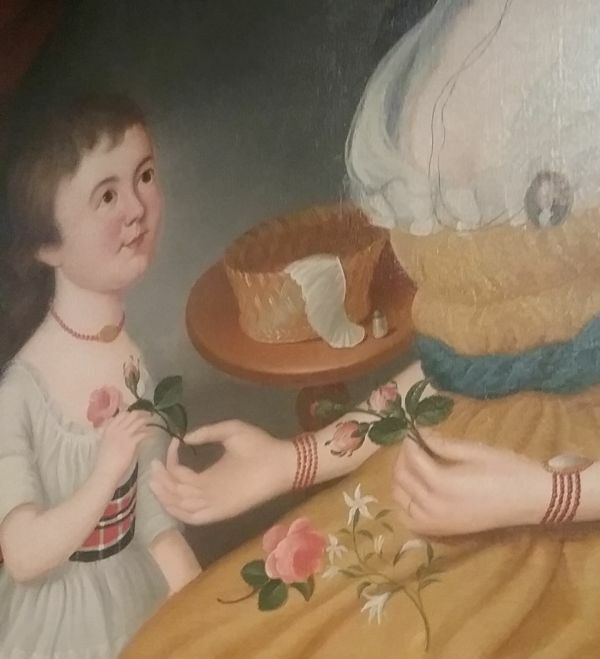 Pamela had been a lady’s maid, but she inherited finer things when her mistress died. 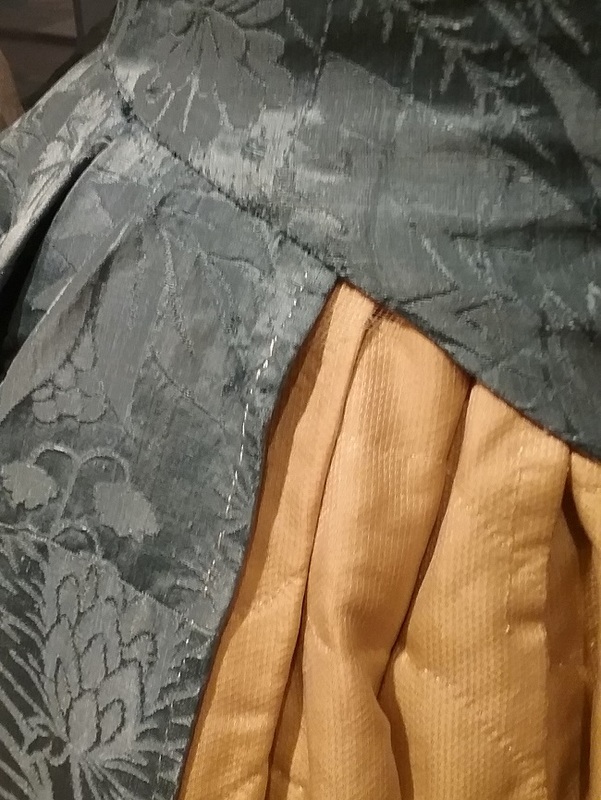 The blue silk gown dates to circa 1750, but was later refashioned. 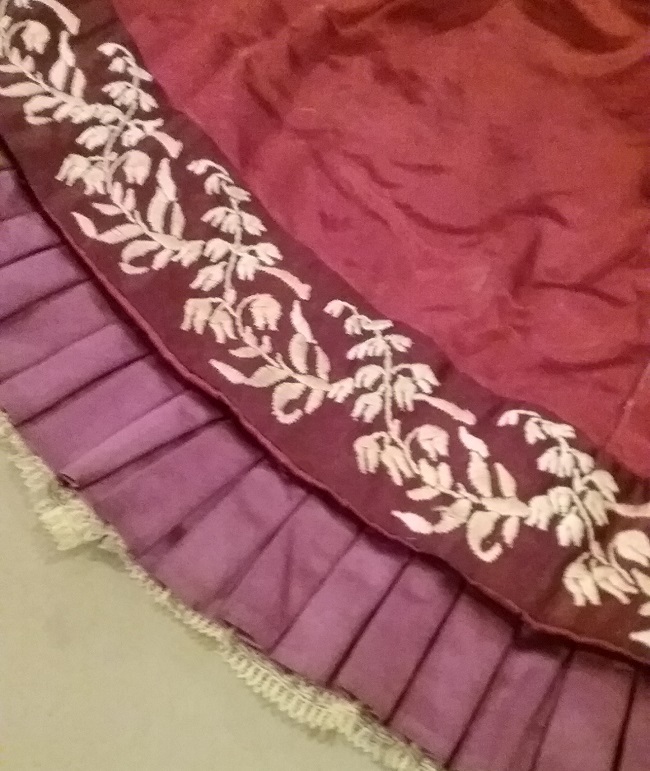 The petticoat was made by Mary Marsh Leggett, and dates a bit later. Accessories play a big role in Pamela, with pockets standing as a symbol for concealment. 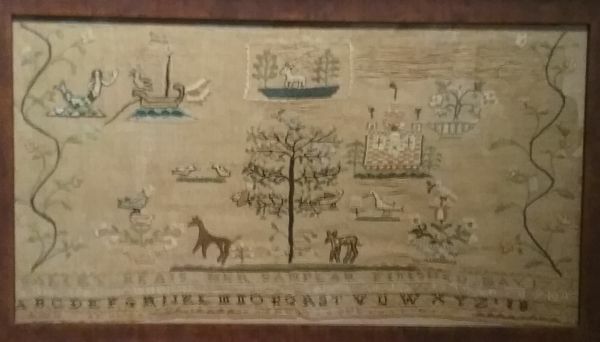 This lovely pocket is wool on linen, circa 1750. 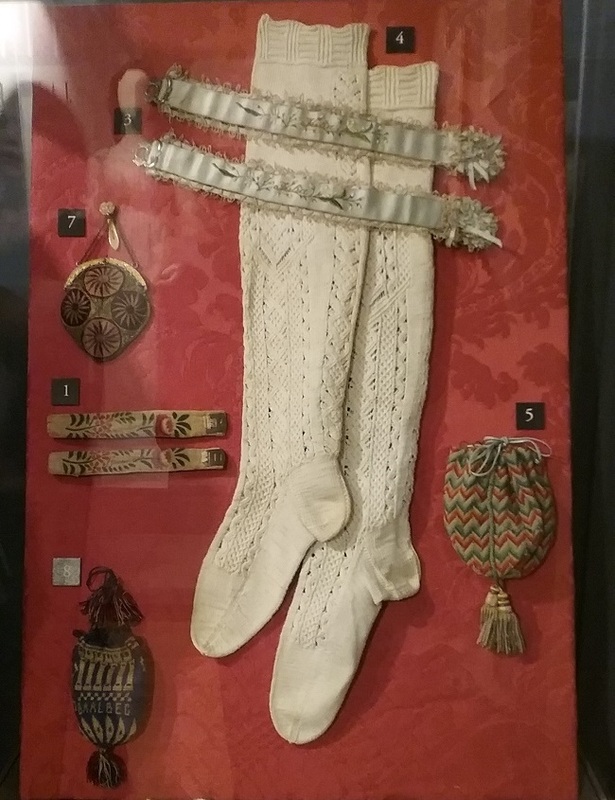 The shoes were worn by Hannah Breck for her 1737 wedding in Massachusetts. 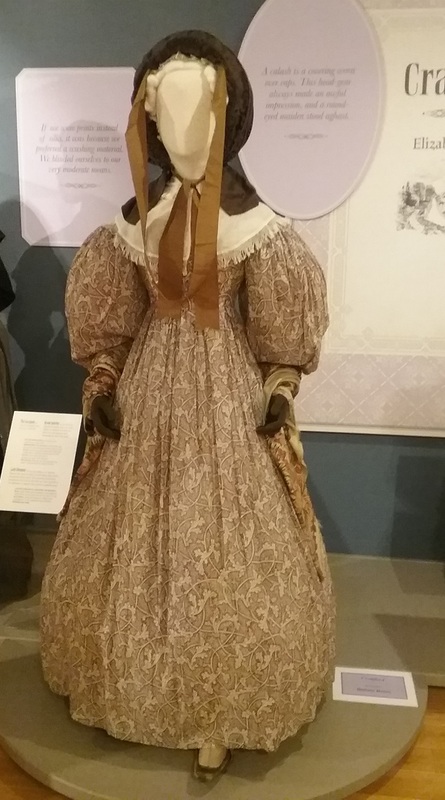 This is a housewife from the early nineteenth century. Every lady’s maid would have carried one in her pocket. 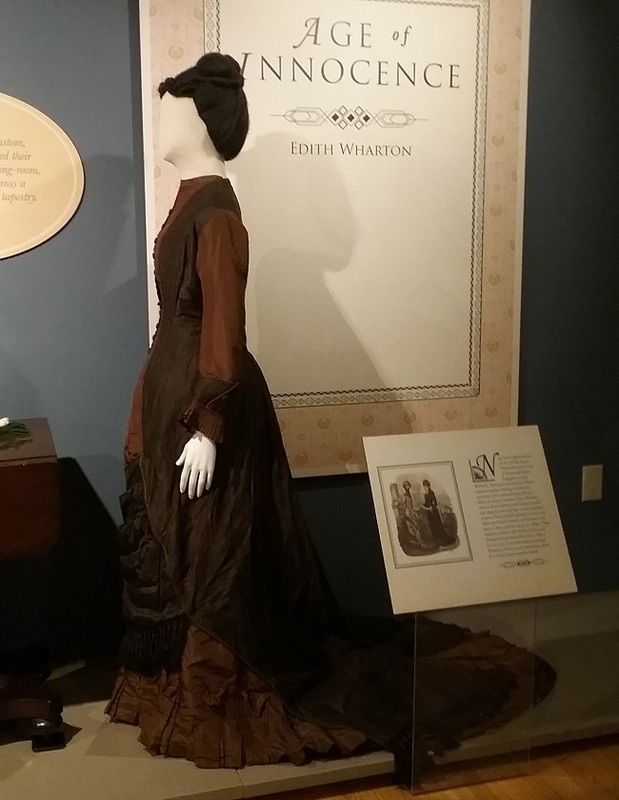 Men’s clothes were also important to the story. Pamela finally shows her love for her mistress’s son by sewing a waistcoat for him, this after he tried to impress her with a fancy gold lace waistcoat. 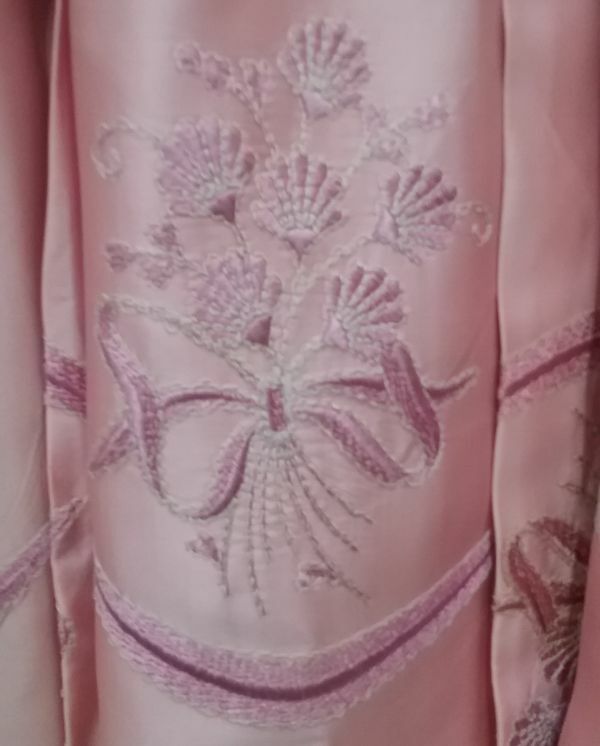 This silk with gold embroidery coat was stunning. Ourika was a young Senegalese woman who had been taken to France and who was educated by a rich family. All’s well until she realizes that as a black woman she has few prospects in the marriage market, regardless of her accomplishments. 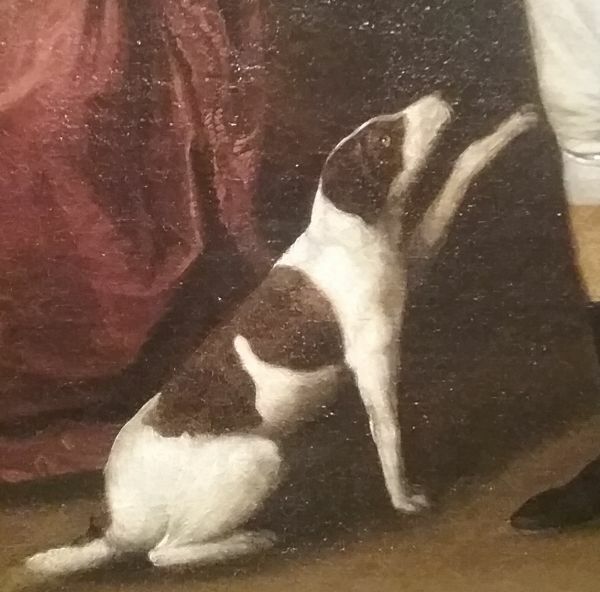 The brown gown dates a bit later than the white, circa 1795. It shows the coming fashion associated with the last years of the eighteenth century, and the first ones of the nineteenth. 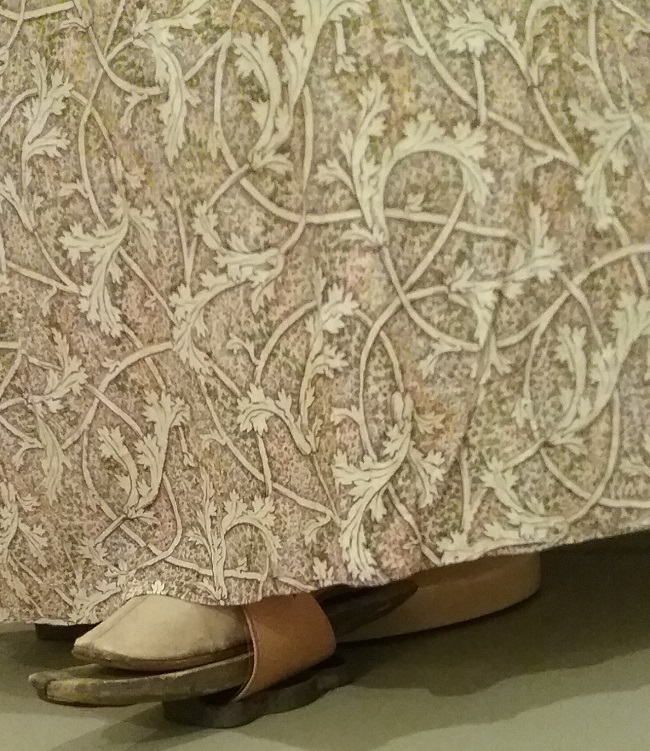 You can barely see the shoes associated with both dresses, but they too are antique. 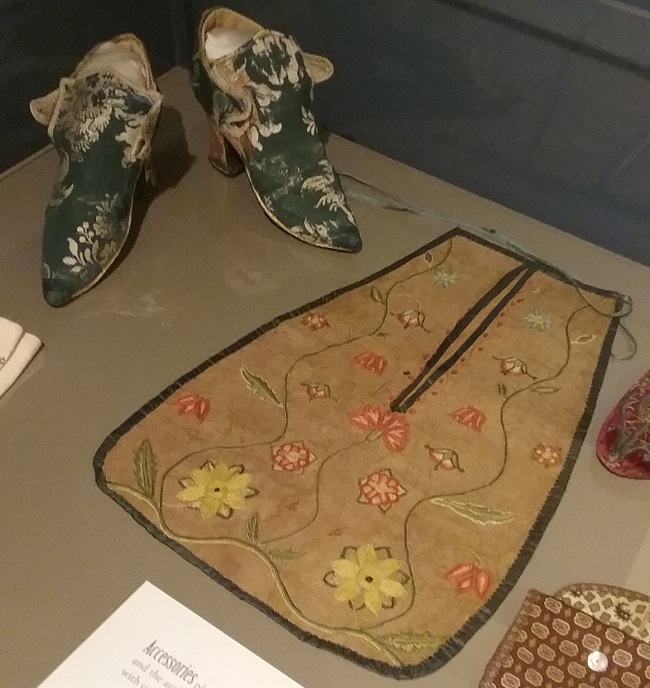 I hate exhibitions where the accessories are so in one’s face that they overshadow the clothes, but this was an instance where I wished for a little more shoe. 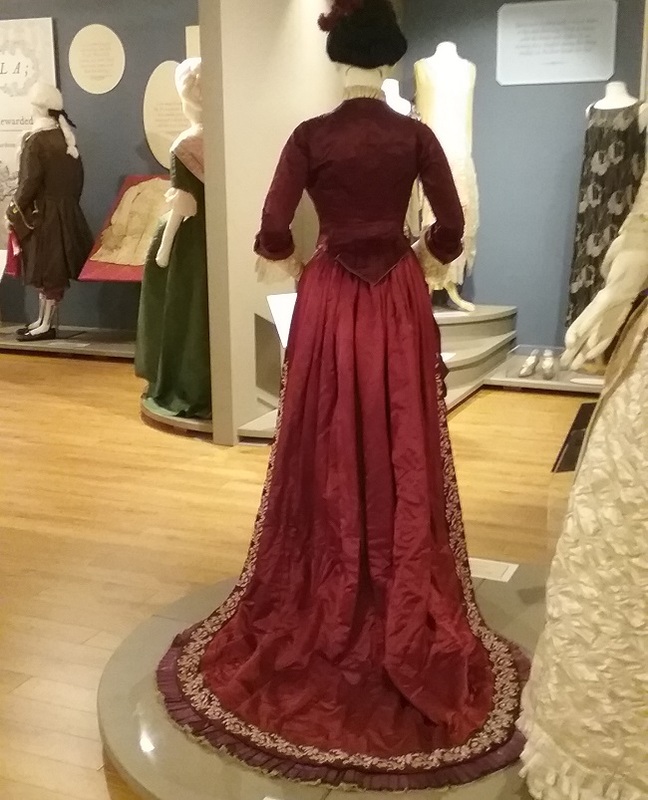 Ourika’s gown is made from silk woven in the famous Spitalfields of London, circa 1770. 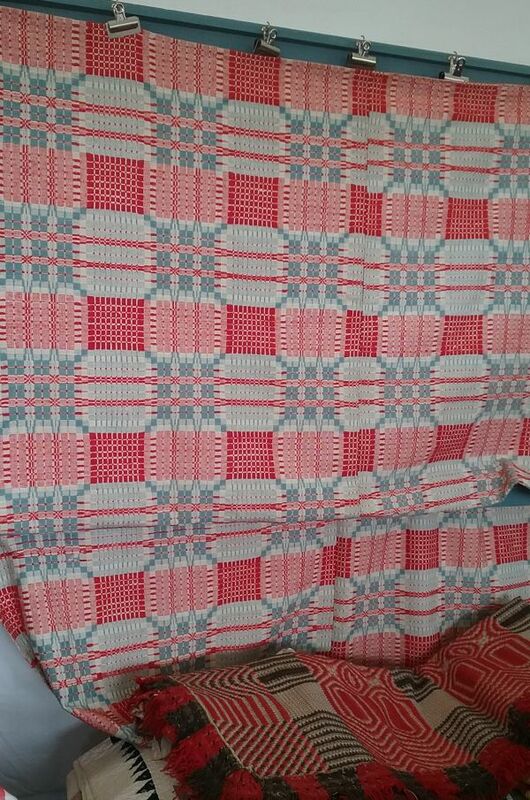 Can cloth this fine even be woven these days? I’m guessing there are few among us who have not read Jane Eyre. My big confession is that I really did not care much for the book; even after three readings I’ve not been able to warm to Jane and her Mr. Rochester. But no matter, as the clothes make up for the story. 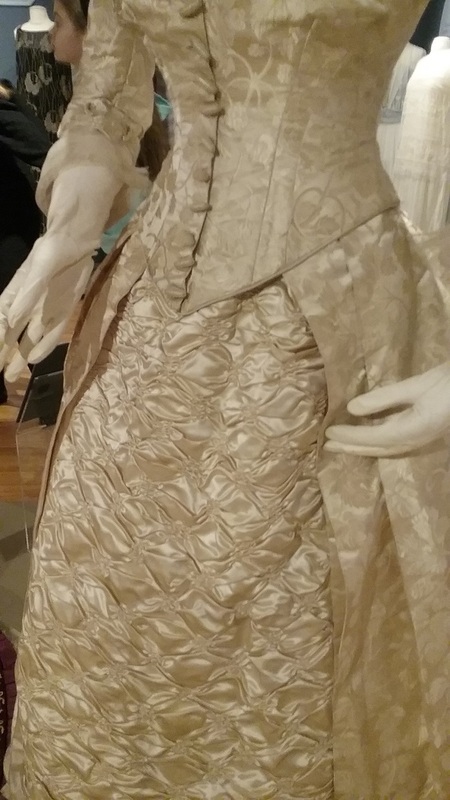 The white wonderfully embroidered dress (circa 1815) represents the haughty Blanche. I really wish you could see the purple checked shoes she is wearing. 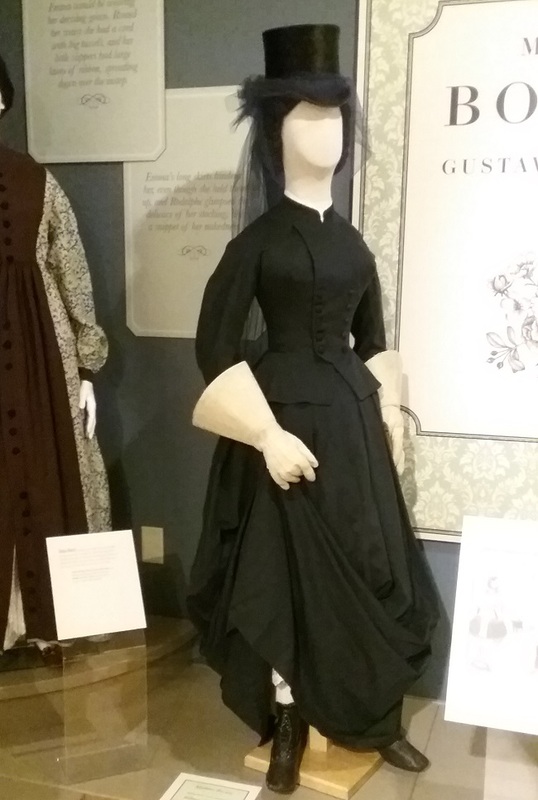 Mrs. Dent is wearing a black cotton and net gown, in keeping with her more conservative character. 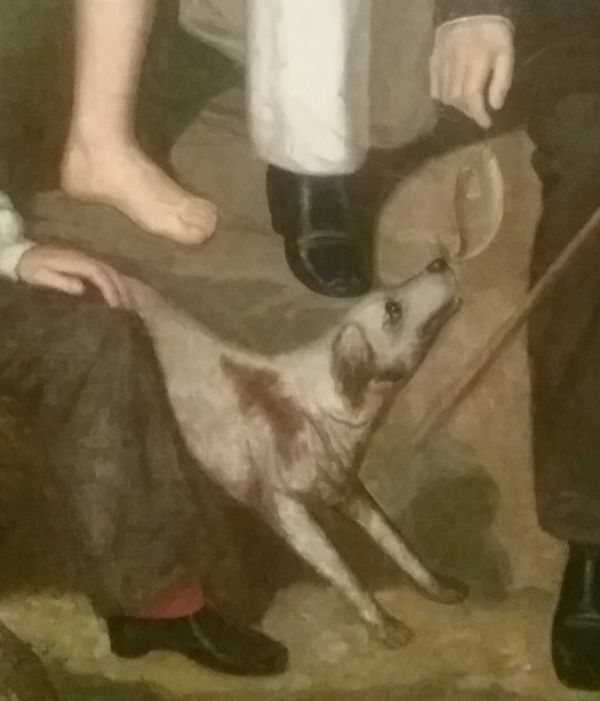 Circa 1818. 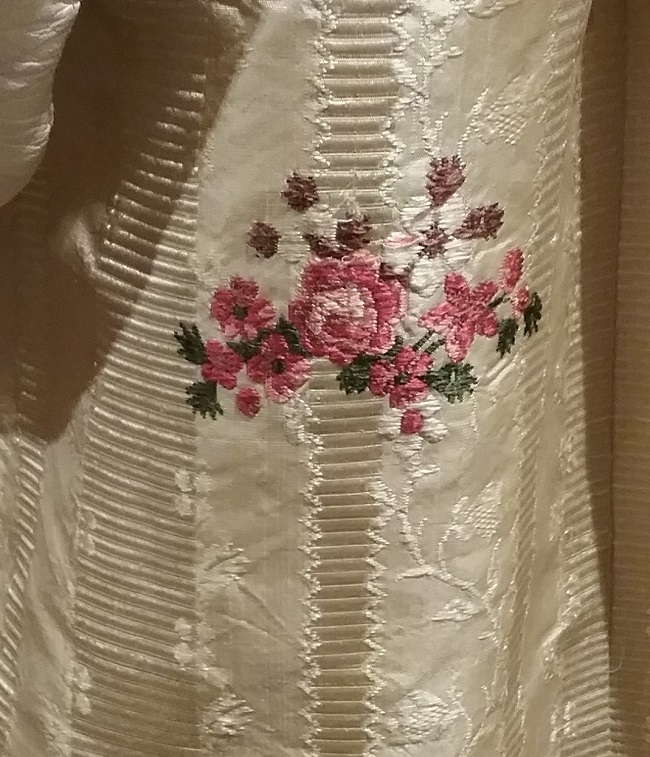 Her embroidered shawl is circa 1805. Mr. Rochester makes his appearance in his paisley banyan, or dressing gown. My best dress (the silver-gray one) was soon put on: my sole ornament, the pearl brooch soon assumed. I perceived my sandal was loose; I stopped to tie it, kneeling down for that purpose. I heard the dining-room door unclose; rising hastily I stood face to face with him: it was Mr. Rochester. 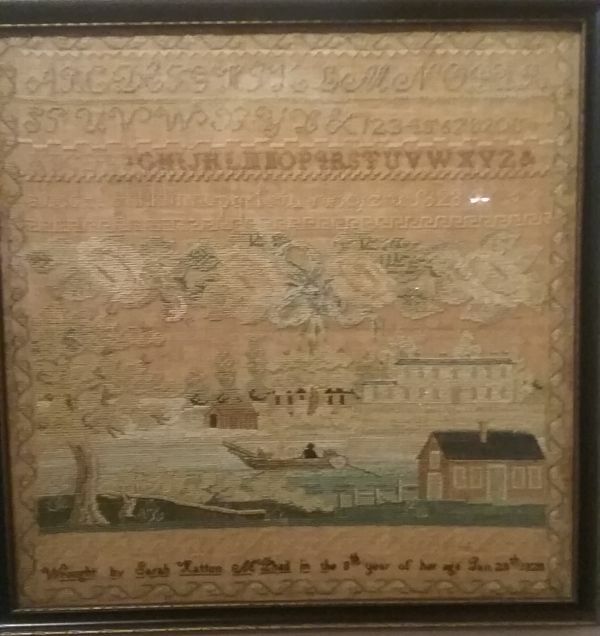 Having these snippets of text from the works represented added so much meaning to this exhibition. Note how Jane’s shoe ties are loose. 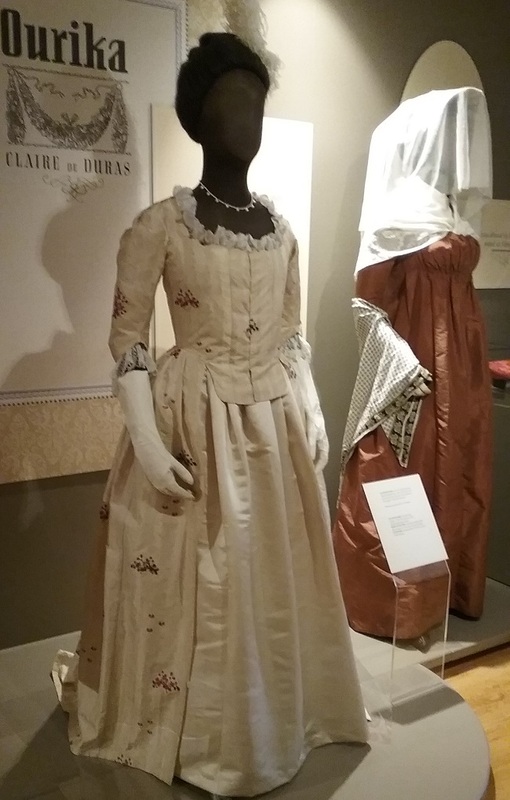 One of my favorite dresses in the exhibition was this one – a circa 1800 embroidered silk evening gown. How about that purple! 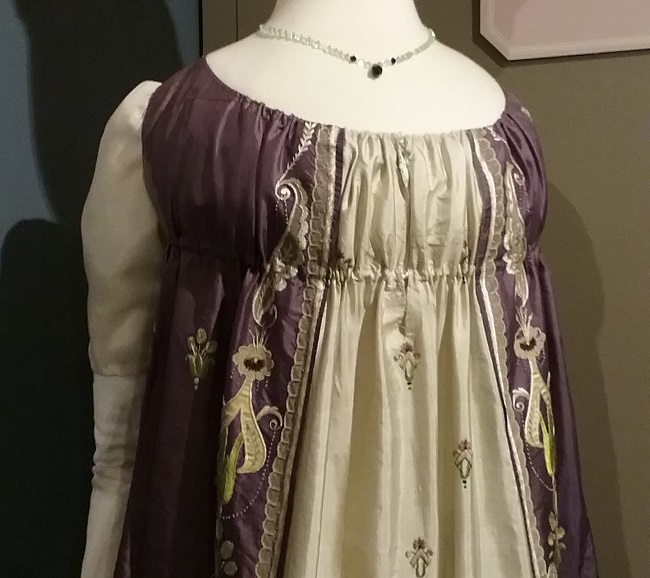 The turban and sleeves are reproduction, but add much to the way the dress is presented. I’ll finish this tour in my next post, but I have a few words to say about cooperation. 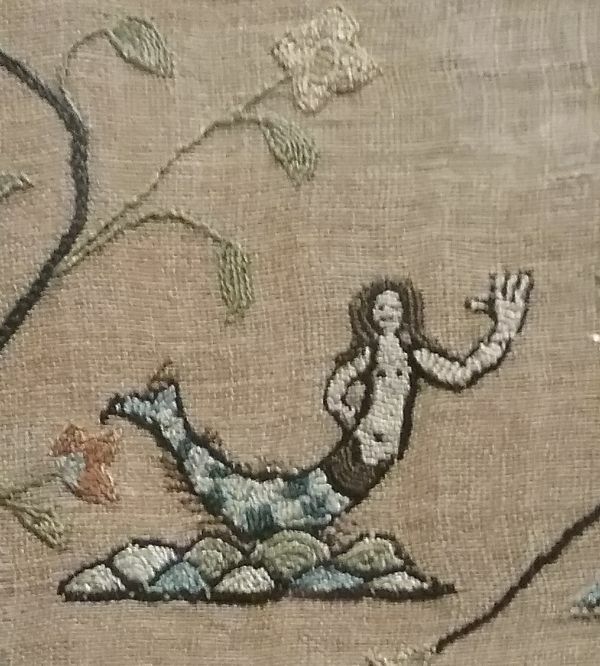 Even though the Fashion Archive and Museum has a very large collection, sometimes one needs a bit of help to fill in the gaps. 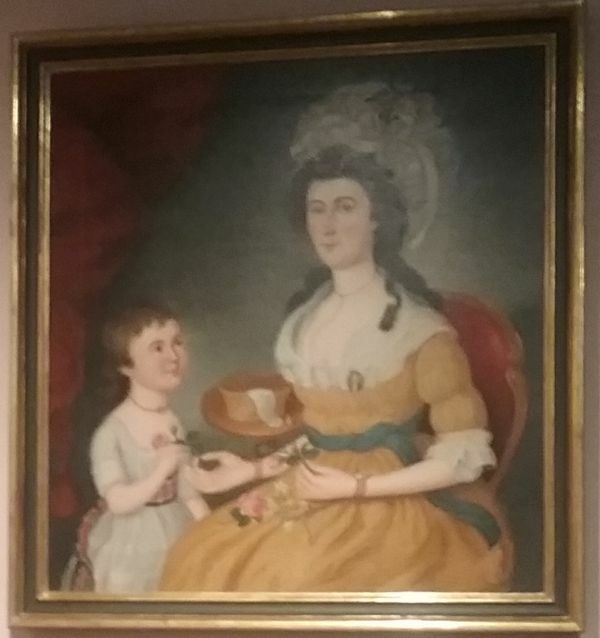 I mentioned earlier that I first saw some of the Shippensburg collection at the DAR Museum. 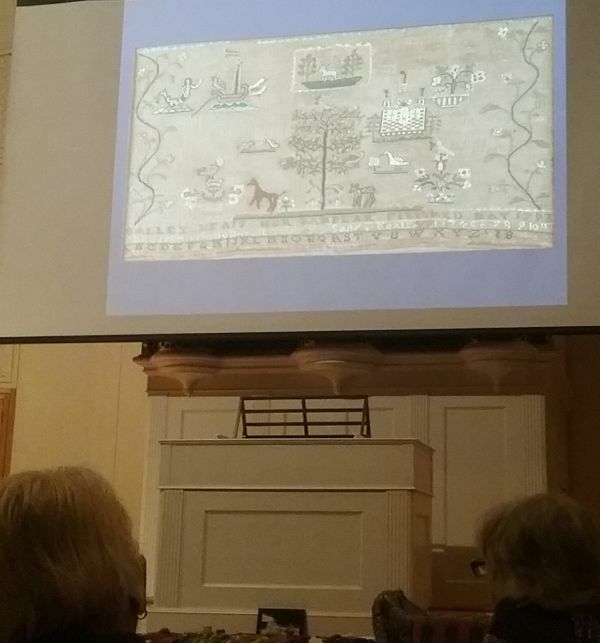 They in turn, have some objects represented in this show, as does the Chester County Historical Society, collector Mary Doering, and the Maryland Historical Society. 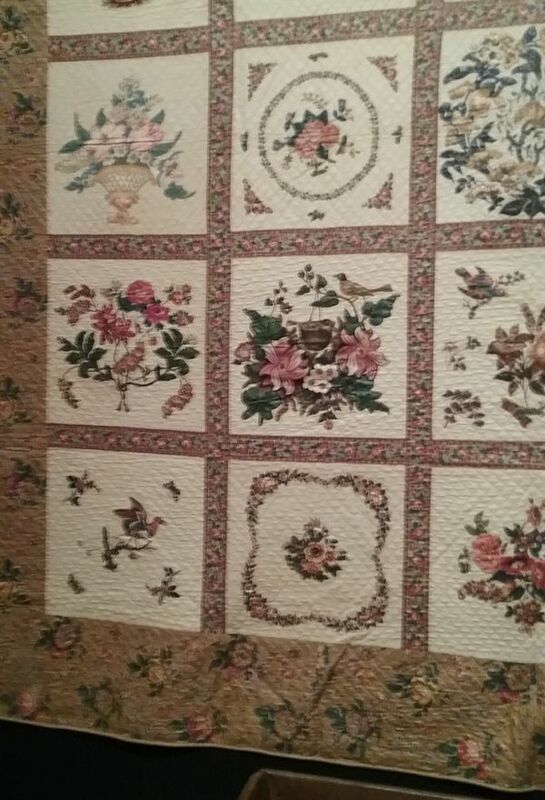 I think it is great the smaller collections can work together like this so visitors can have such a delightful experience. As any good trip does, my recent visit to Atlanta involved a bit of shopping for old stuff. 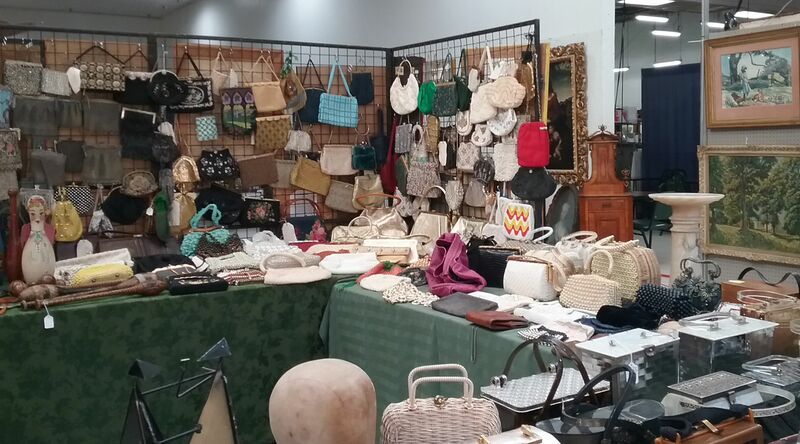 Just as a good exhibition is a learning experience, so is a bit of browsing antique markets. 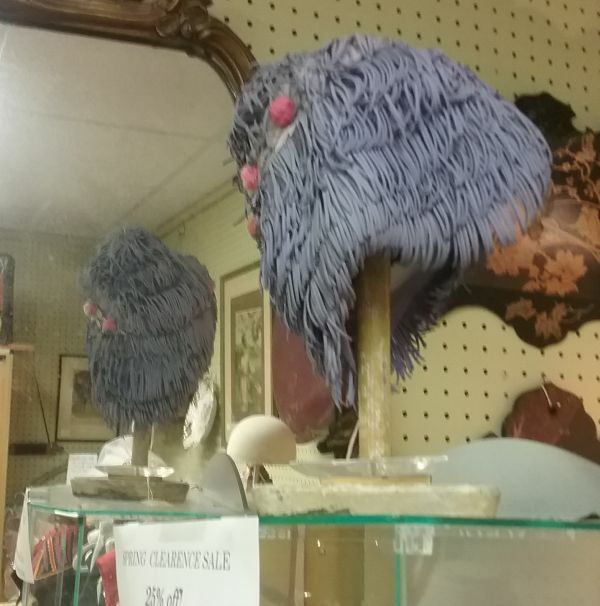 So here’s a bit of what I saw, but did not buy. 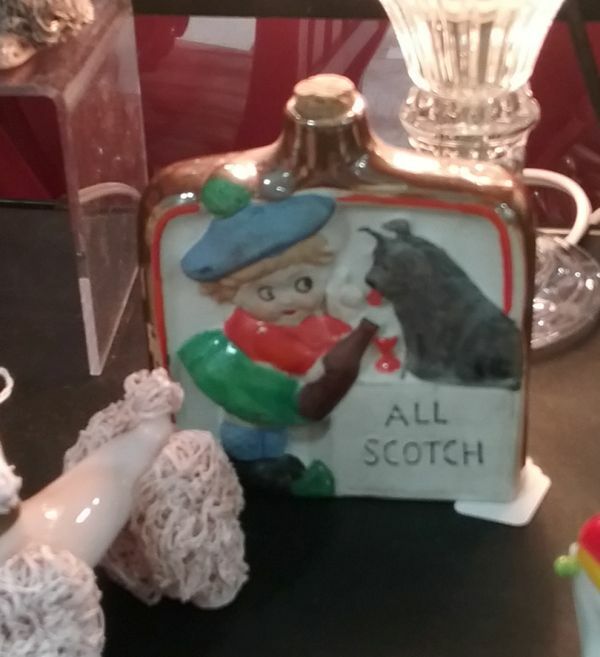 I’m not too sure about the practicality of a ceramic flask, but I thought the one above was cute, even if the Scottie was a bit pudgy. I first did a bit of looking in Chamblee, a town that has been overtaken by the urban sprawl of Atlanta. 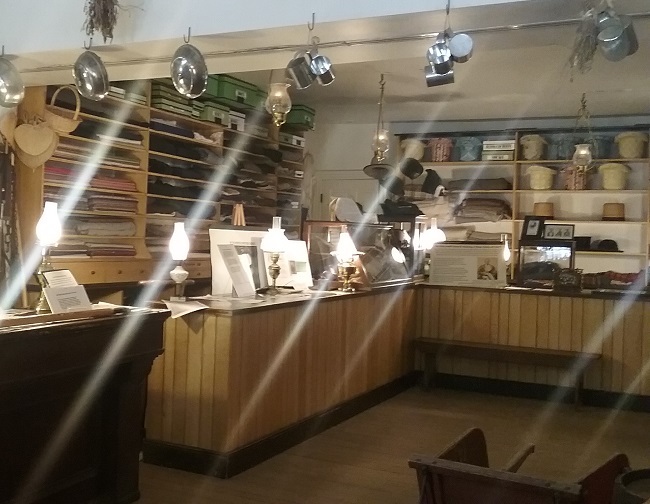 For years the place has marketed itself as a destination for vintage and antique shoppers, and there are still several very good antique stores there. However, I was really dismayed to find two of my old favorites gone, one a victim of gentrification. What used to be an Aladdin’s cave of treasures is now a cafe and a “design center”. Still, there was more than enough to spend several hours of looking. You would think that the bathing cap above would have gone into my shopping cart, but I’m afraid it was a victim of age and deterioration. The rubber was brittle and there were bald spots. A real shame, as this one was really great. I really blew this one. I was so bummed about the store across the street being gone that I had a hard time concentrating on the good stuff. 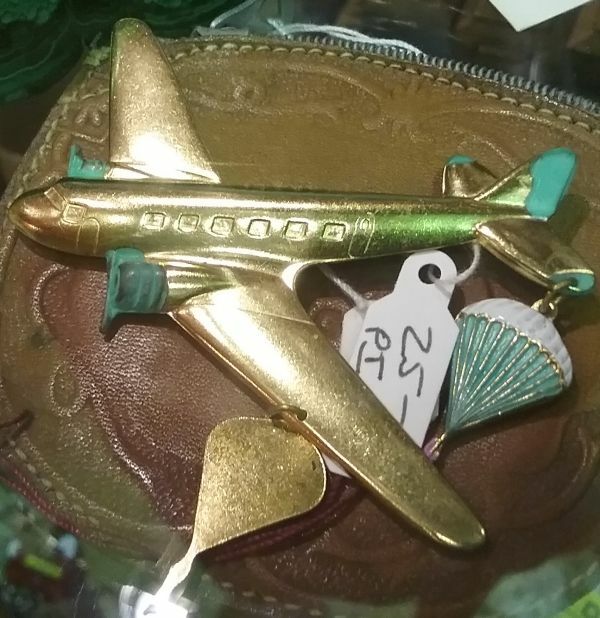 This is just a great pin, with the DC-3 plane and the two parachutes. What was I thinking? 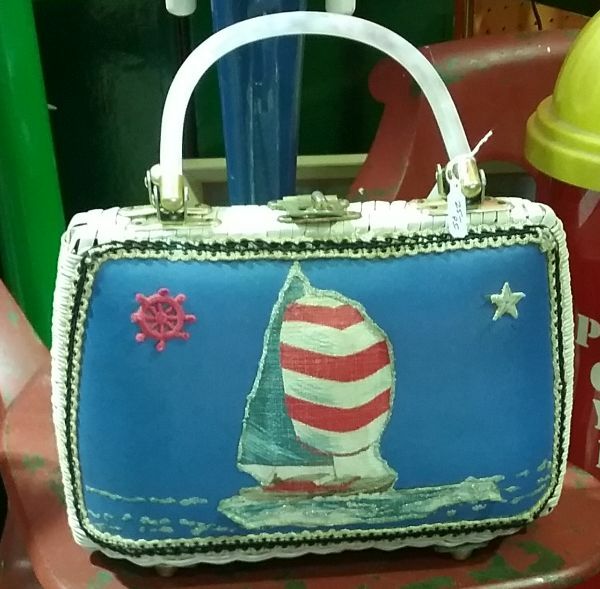 This was rather cute, and I do love the nautical look, but I had to pass due to the amateurish appearance of the design. 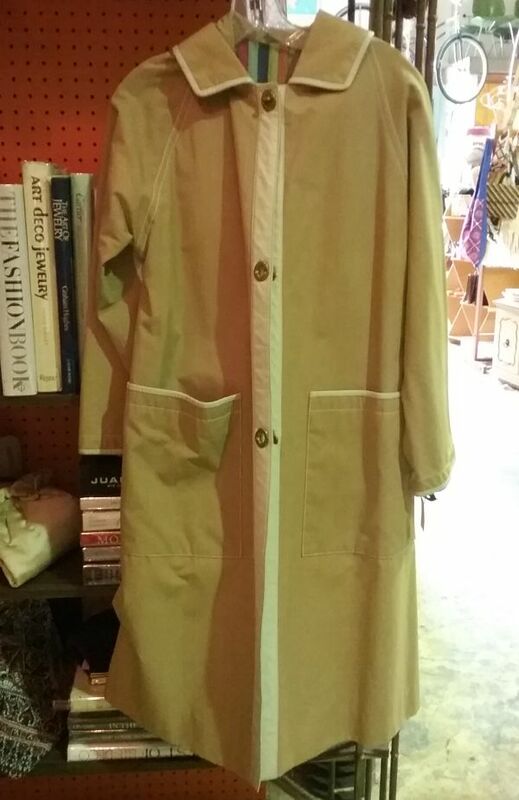 Nothing amateurish about this coat, though. 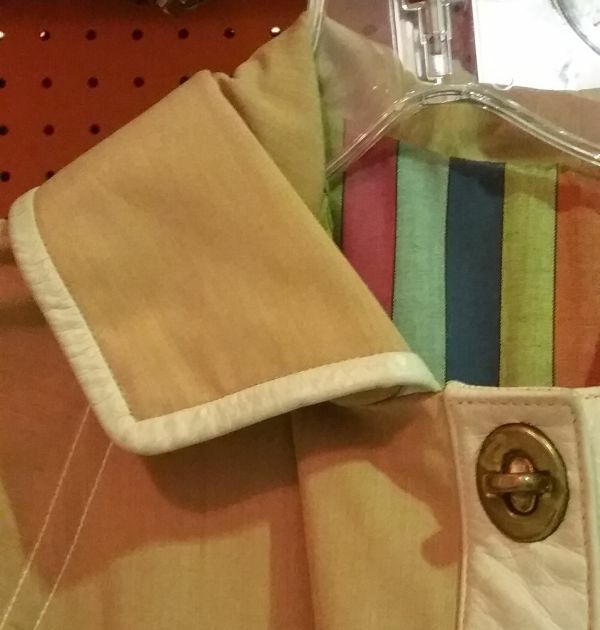 The first tip-off that this was a Bonnie Cashin design was her signature stripe used for the lining. 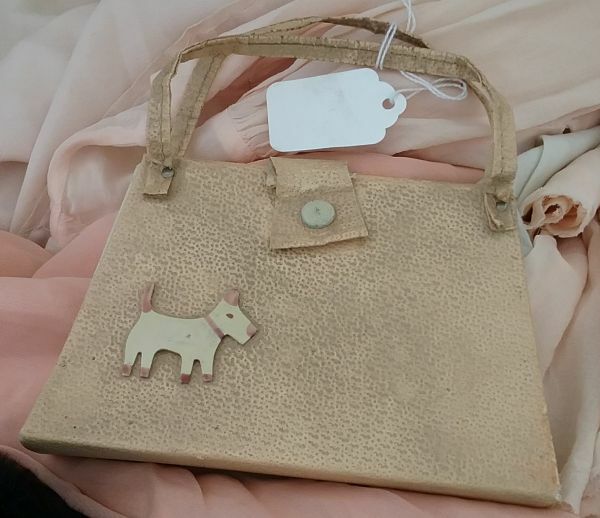 Then there are the turn-lock closures, and the leather trim, and it all adds up. 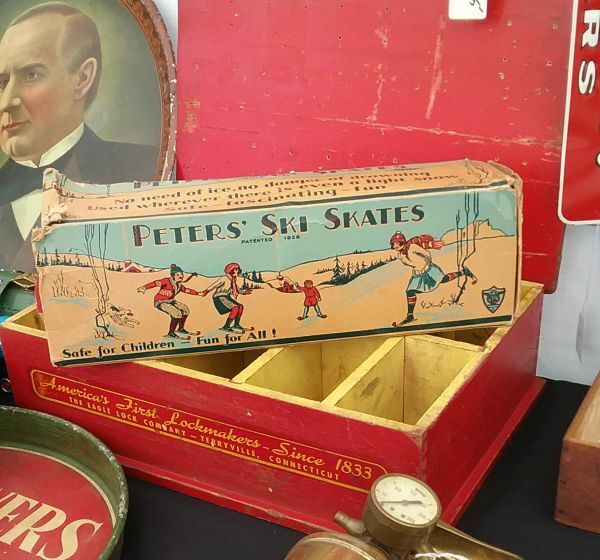 Besides Chamblee, I was able to fit in a quick trip to the monthly Scott Antiques Market. 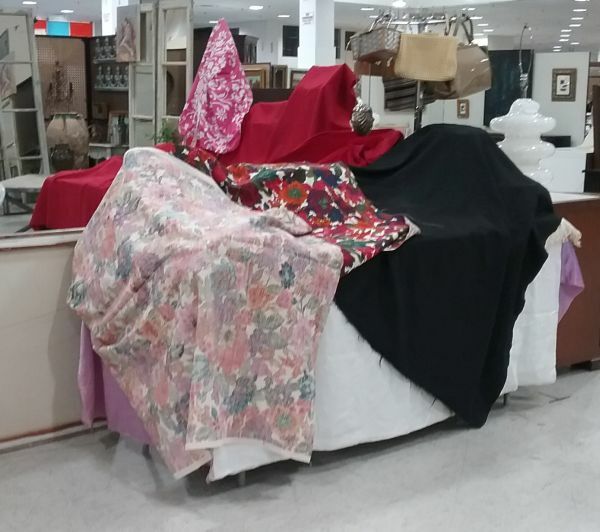 Scott’s has never been my favorite market, as it tends to cater to the decorator rather than the collector. 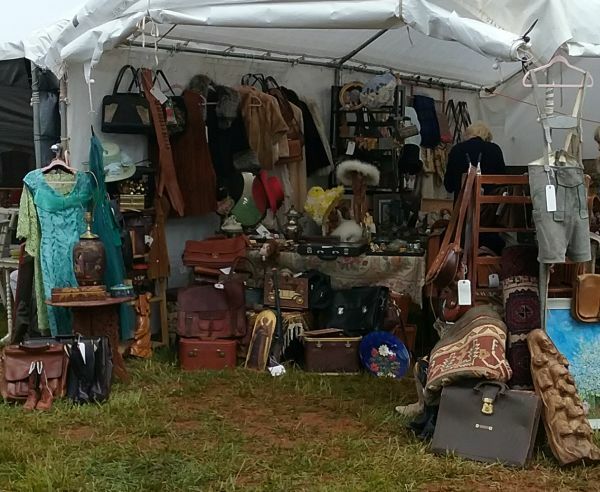 But there are some very good vendors there, and I have found a few treasures over the years. 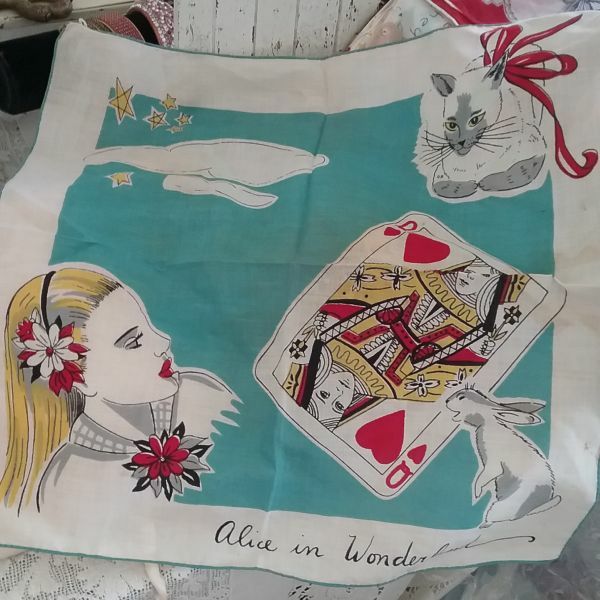 I wasn’t in the market for a handbag, but this seller also had hankies, including a terrific Tammis Keefe that I did buy. 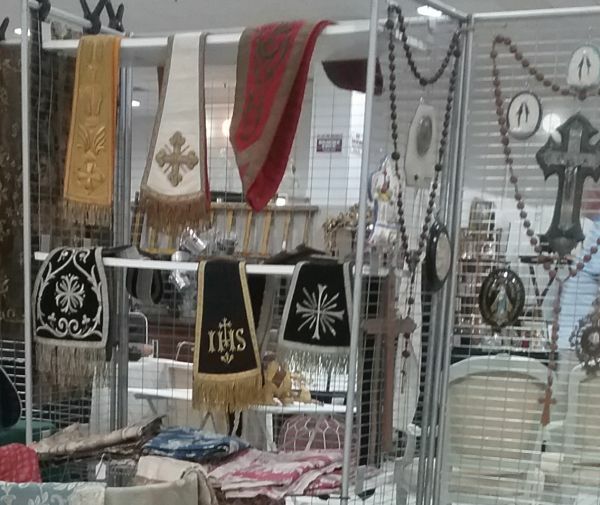 For those of you who were inspired by the Met gala this year, one seller has you covered when it comes to Christian iconography. Here’s help for the fashion indecisive in the form of a game. 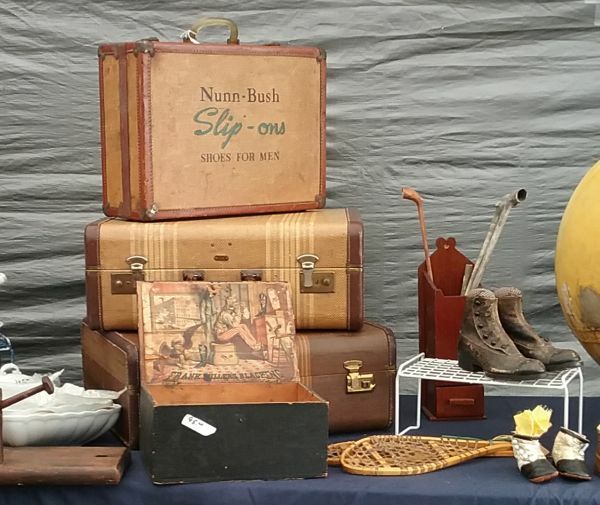 All that was left of this salesman’s kit was the suitcase. Most of Scott’s is held inside, but there are also spaces for people to set up outdoors. 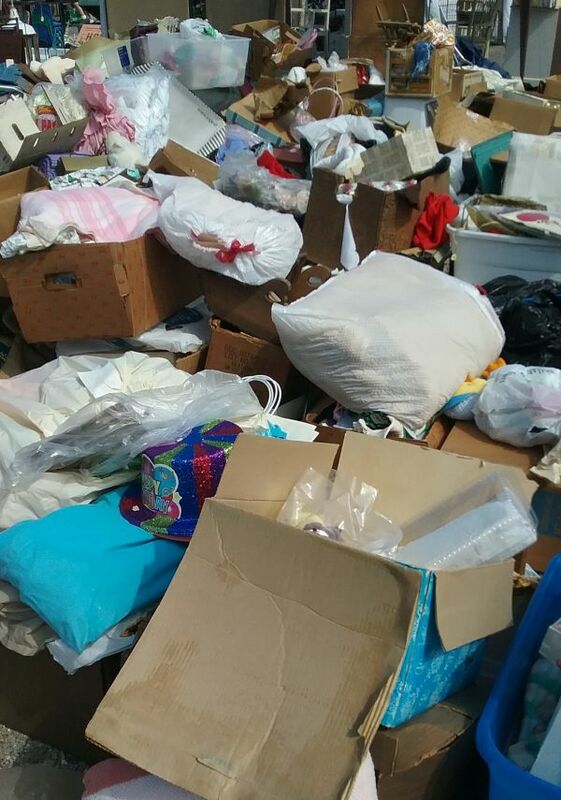 The seller uttered those magic words, “Feel free to dig.” Unfortunately, most of the stuff was from the 1980s and later. 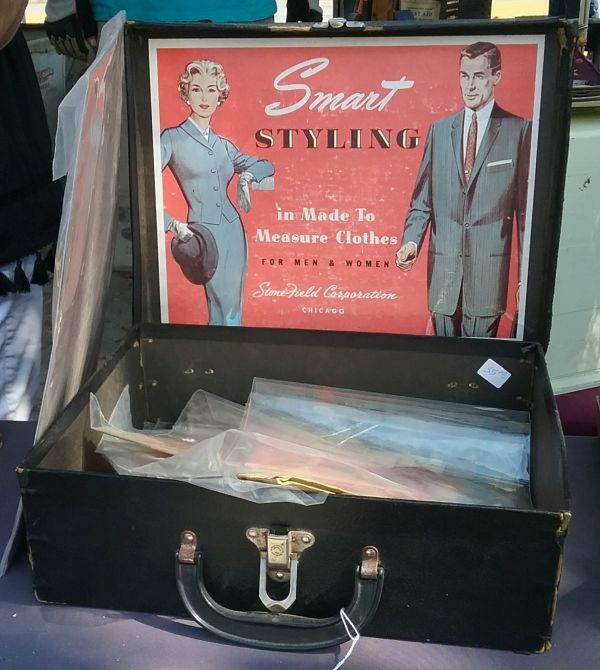 There were vintage bargains to be had. This dress was an incredible $48. 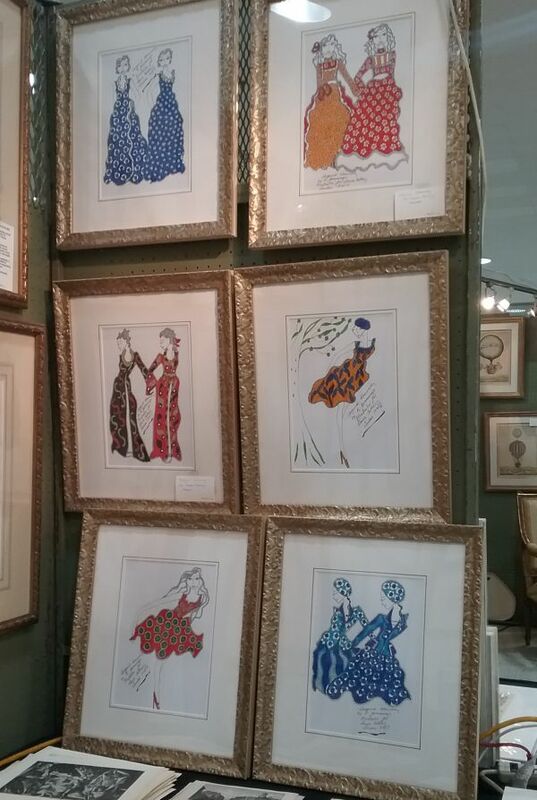 These were framed fashion sketches made for Laura Ashley in 1970. 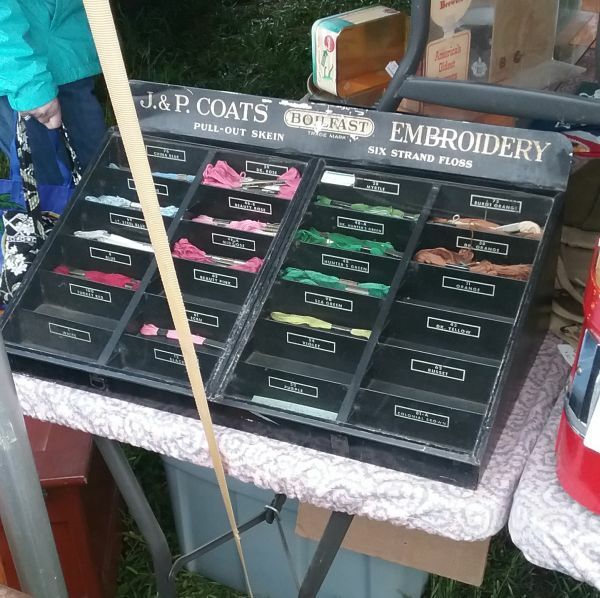 They were really fantastic, and had price tags to match. 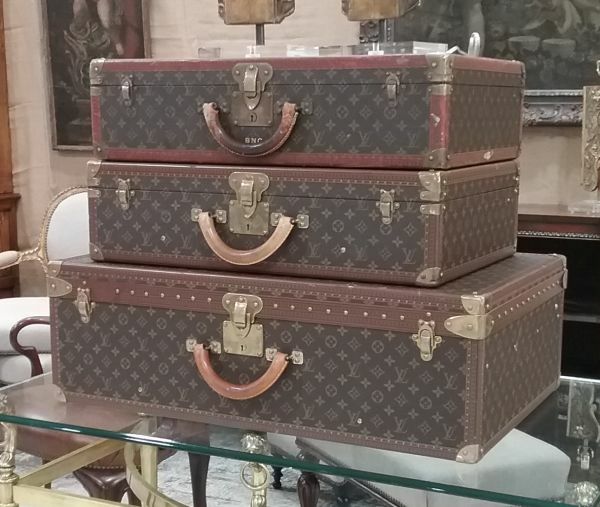 The vintage traveler in me wanted these LV suitcases. 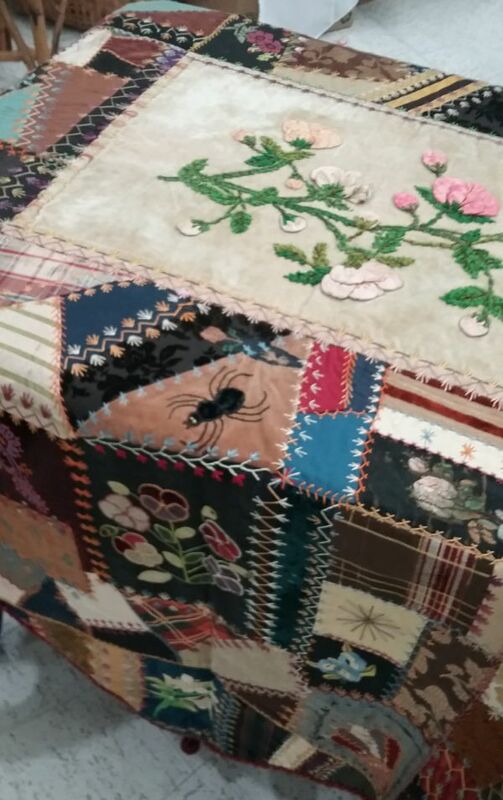 I am a real sucker for crazy quilts, and this is one of the best I’ve seen in a long time. That spider is the absolute best! And here is part of the reason I don’t make much of an effort to go to the Scott Market more than every three or four years. The market opens at 9 am, but for the first hour many of the vendors are still not open. And this was on the second day of the show. For someone like me who needs to get on the road to home, this is a big inconvenience. Sellers! If you are at a show to sell, you need to be there so I can your stuff. 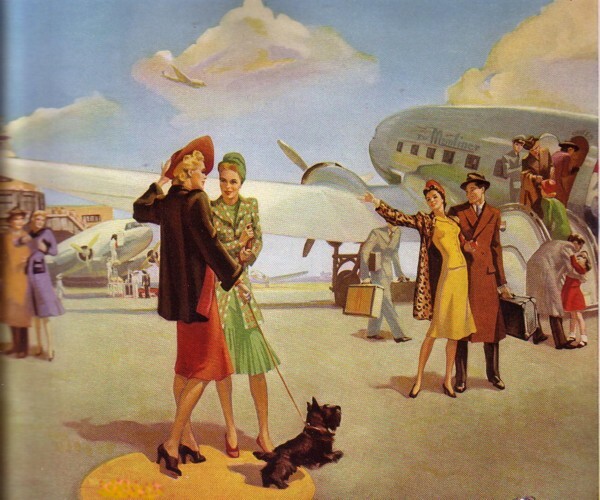 I’ve never much liked flying, and especially since every ounce of glamour has been squeezed out of the experience. I think the last time I felt special on an airplane was in the early 1990s on a Luthansa flight. I’m glad that flying is not the extravagance that it must have been to these travelers in 1940, but it would be great if people tried a little harder to make the experience tolerable for others. To see the worst of it, check out @passengershaming on Instagram. I’m always happier when I can drive to an event or destination. Tomorrow I’m headed for Cincinnati where the Midwest Region of the Costume Society of American is holding their annual symposium. Two days of fashion history and museum visits really is my idea of heaven on earth!